Here is a list of best free Online Amortization Schedule Maker. Spreading payments over multiple periods to pay off the loans and assets is termed as amortization. In order to view the payment contribution towards the principal and interest, amortization table is necessary. There are a lot of websites that can be used as online amortization schedule maker. 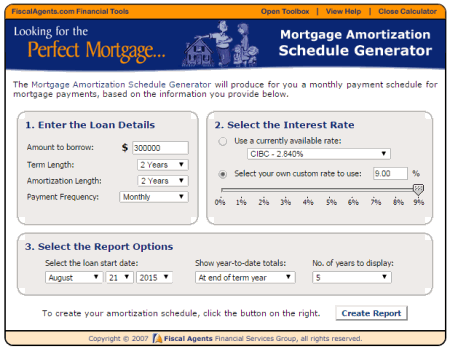 These online amortization schedule makers are quite easy to use, and can help to make loan decisions. My favorite online amortization schedule maker is AJ Design Software. It has all the features of the general online amortization schedule makers. The best feature available in it is that you can add extra payment in each of the payment schedule chart, and the results are updated automatically. You can also check out the list of Amortization Shedule Maker Software, Online Amortization Calculator, and Excel Based Amortization Schedule Calculator. AJ Design Software is a website having a number of Science, Math, Physics, Engineering, and Finance Calculators. One among them is a home mortgage loan rate calculator. Input the loan amount, first payment date, interest rate, loan term, loan extra monthly payments, and start date of any extra payments. Based on the data input by you, the total payments paid, and total interest paid along with the savings is displayed in case of normal payments, along with extra payments. Based on the data the amortization table is generated, showing the period of payment, date of payment, monthly payment amount, monthly payment interest, monthly principal payment, monthly extra payment, single extra payment, remaining loan balance, total payment, total principal payment, and total interest. 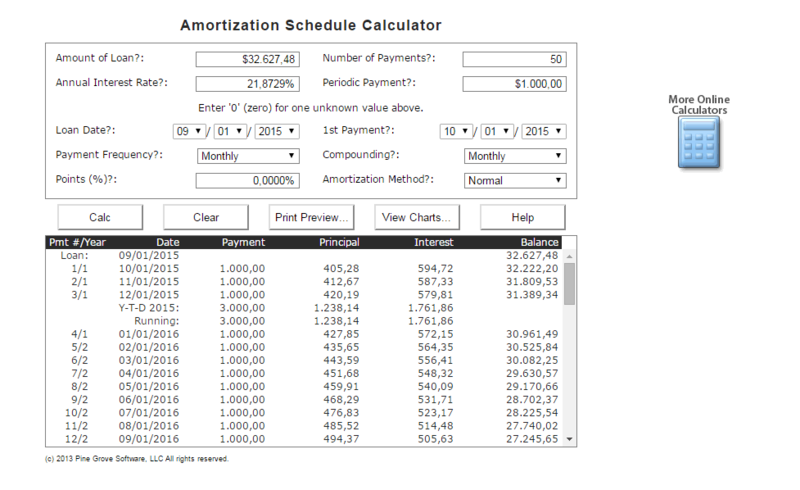 The best, and the most unique feature of this amortization schedule calculator is that, you can easily add any single extra payment in the amortization table, and based on that the amortization table is updated automatically along with the other entries. Dr Calculator has a very beautiful and feature rich mortgage calculator, providing various options to display the amortization table, and amortization charts in various different formats. Use the sliders to select the principal, loan term, start month, start year, interest, and payment. 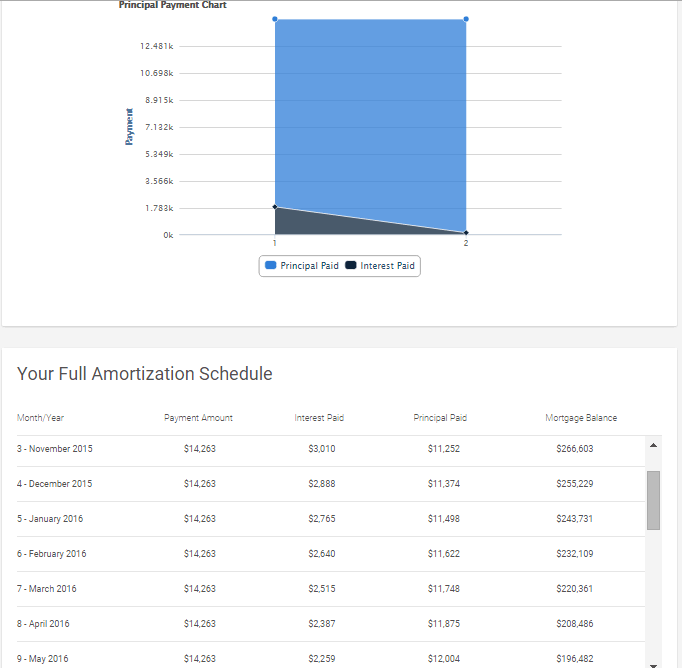 You can view the amortization graph, repayment chart, balance graph, interest graph, annual table, monthly table, payments, table, summary, and settings. 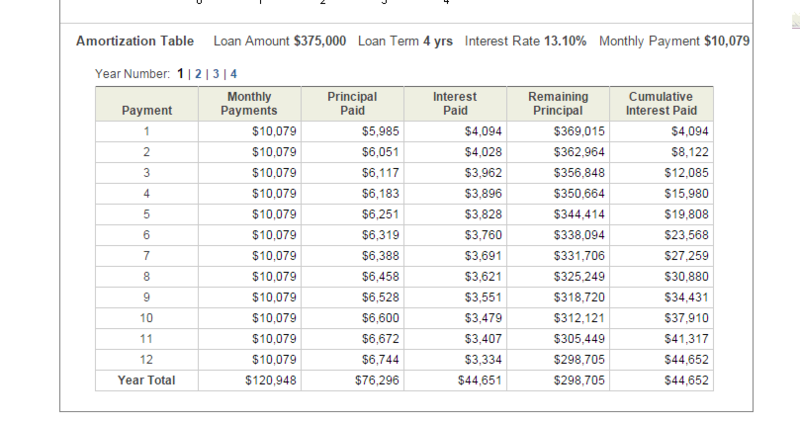 The loan summary displays the payment, total interest, total payment, extra payment, and savings. 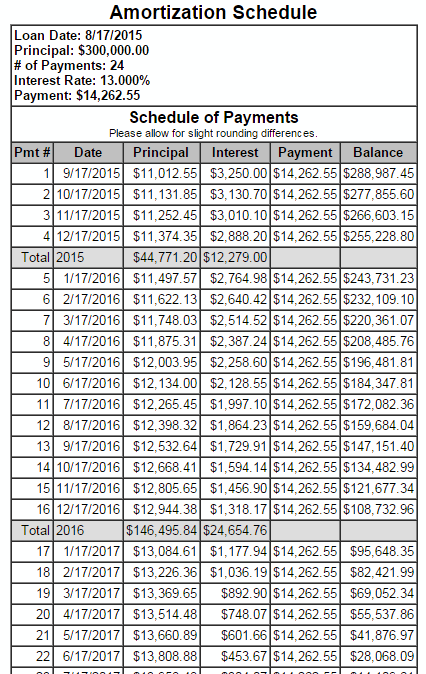 The amortization table displays the payment month/year of the payment, interest, principal, and remaining balance. You can also change several settings of the payment frequency, loan term, rounding, extra payments, mortgage insurance, compound frequency, year, interest sliders, and initial payment. You can also enter any expenses, prepayment, extra payment, interest, and ERM values at the end, and choose to display the result as per your needs and requirements. The printout of the report can be taken for further use. MathPortal.org is a very useful website for students, and maths fanatics. It features a very beautiful tool to generate amortization schedule. It doesn't only generates amortization schedules, but unlike others it also provides solution and an explanation to the problem on how the schedule is generated. You have the option to choose from the options to calculate the payment amount, loan amount, loan term, and interest rate. Enter the known variables, like: loan amount, loan term, interest rate, and monthly payment. Click the find button to search any unknown variable. In case you want to just check out the examples, click the generate example button to generate the example. The option can be selected to view the solution with, or without the explanation. 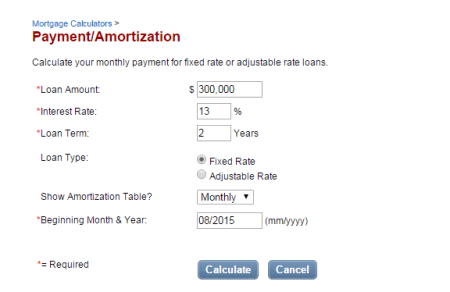 Click on the show amortization table, so that the amortization table is displayed properly. 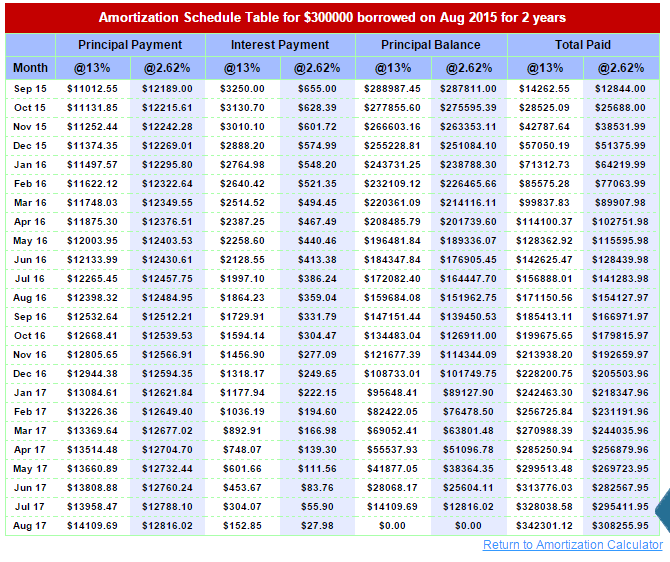 The amortization table displays the payment required, principal paid, interest payment, and the remaining balance. In case you choose to select the option to show the explanation to the solution, the explanation is generated in a quite simple and easy to understand format. WebMATH is an awesome website where you can get answers to all your maths queries. Among many tools available, it also features a tool to create online amortization table. Unlike other loan amortization table calculators which just let you generate the amortization table, this website also provides you the processes and formulas involved in achieving the desired result. In order to generate the amortization table, enter the loan details, like: loan amount, duration of loan, number of payments per year, annual interest rate, and extra amounts if any to be paid each month. Click on the button available to display the loan payment schedule to view the detailed solution to the problem provided, and the required amortization table. The monthly payment is calculated, and the total extra amount to be paid to the bank is provided. 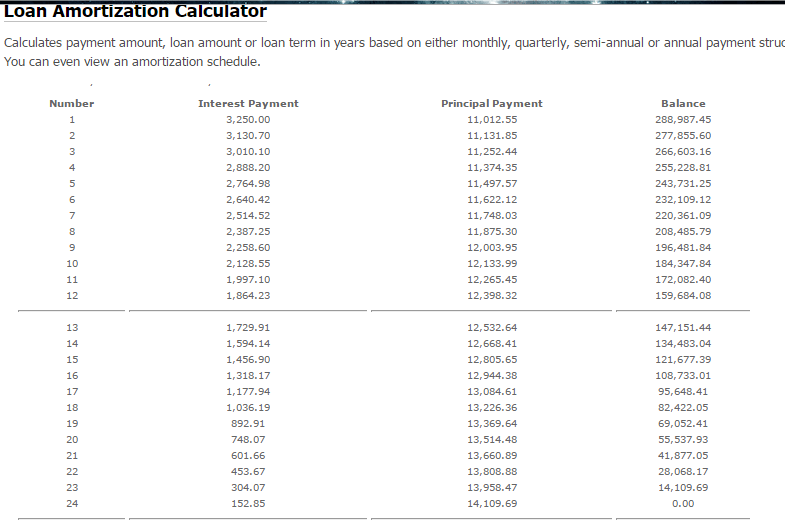 The amortization table displays the loan payment details like payment amount, interest payment, principal payment, total paid to principal, total paid to interest, and total left to pay. SUPER BROKERS is a website which has a number of tools to take care of your mortgage problems. One such tool which can prove out to be quite useful is the mortgage payment calculator. Enter the loan amount, mortgage term, interest rate, amortization duration, payment schedule, and prepayment amount. Also the options to display the full amortization table, and turn off annotations can be selected by checking the appropriate check-box. After calculation, yearly breakdown of payment and lump sum is generated, showing the payment, total payment, total principal paid, total interest paid, remaining balance, and lump sum payment. The mortgage summary highlights the details of the loan as compared to the calculated mortgage and simple mortgage, providing details in different fields, like: overall, term summary, and mortgage amortization summary, so that you can get to know the difference between the two types. It also displays the payment schedule showing the payment, term interest cost, amortization interest cost, and amortization savings over monthly schedule, to provide you an idea of how much you can save using other payment schedules. Different graphs are also displayed, like: amortization of principal by year, yearly interest paid, payment allocation of calculated mortgage, and payment allocation of simple mortgage. 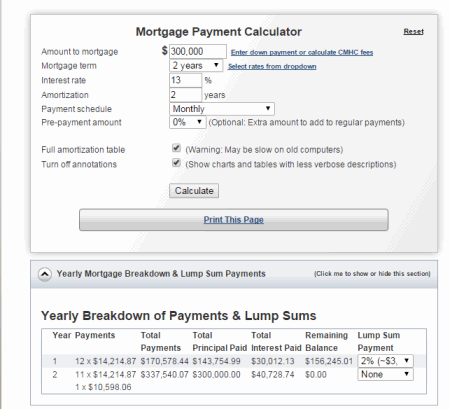 The full mortgage payment calculations displays the regular payment, lump sum payment, total payment, total principal paid, total interest paid, and remaining balance. You can also choose the option to take a printout of the page. MyCalculators.com has a number of calculators hosted on its website, one of it being the loan calculator. Enter three fields out of any three known items, i.e. : principal amount, number of months, interest rate, and monthly payment. The unknown variable is to be left blank, and in order to calculate the value of the unknown amount, click on the button below the provided text-box. You can choose the option to select the duration in which the interest is compounded from the following options: daily, weekly, monthly, quarterly, semi-annually, and annually from the drop down menu. On clicking the button to generate the unknown variable, the total sum required to pay is displayed. The first payment month and year can also be selected. The amortization schedule option to be generated can be selected using the radio button. 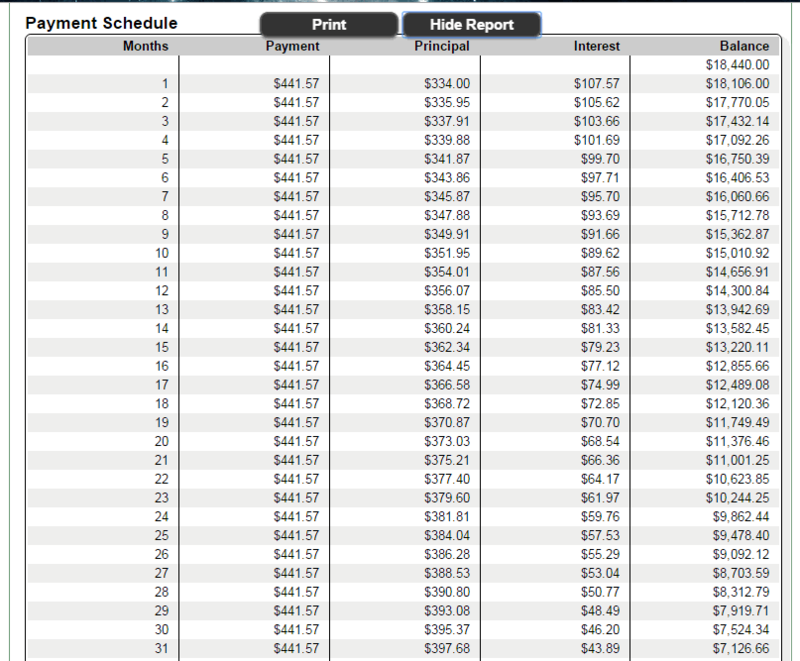 Either the simple schedule, detailed schedule, or the schedule with year-end annual totals can be generated. Click on the view amortization schedule button in order to generate the amortization schedule. The amortization schedule displays the month of payment, payment, principal paid, interest paid, and remaining balance. Finally the totals of the payment, principal paid, and interest paid is also generated. 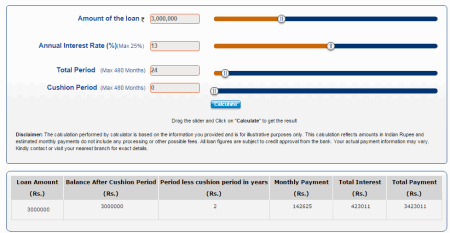 CalcXML website features a number of financial calculators, one of it being the loan payment calculator. 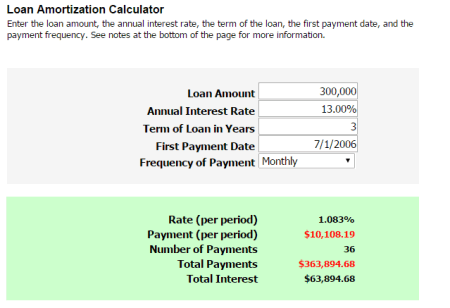 Enter the loan amount, annual interest rate, loan term, and the desired table display. You can also choose the option to display the desired table as biweekly, monthly, or annual view which is not available in other free amortization calculator websites. On clicking the submit button, the estimated payment, and the total interest to be paid is displayed. 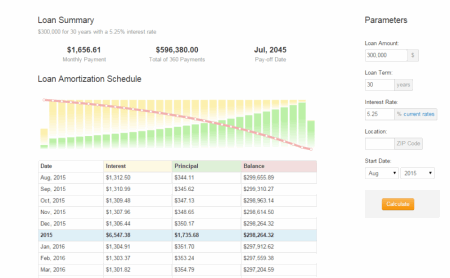 An amortization graph is also displayed, showing the yearly interest, payment, and the remaining balance. 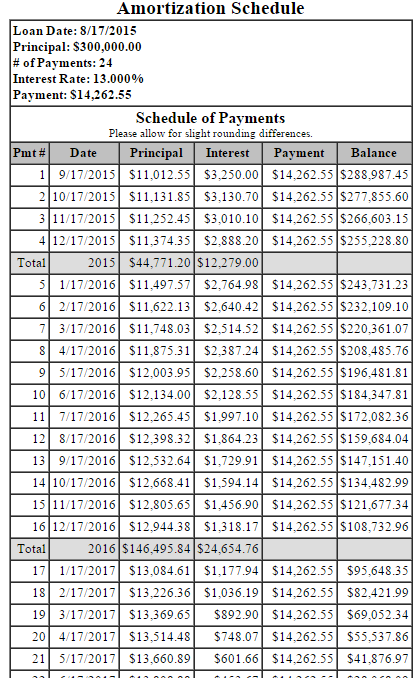 The detailed data table displays the beginning balance, interest paid, payment, and the ending balance. If required, the PDF report of the payment can be generated displaying the complete report. Vancity, a financial co-operative banking service provider, has a mortgage calculator that can be used for calculating affordability, payment, amortization, and comparison of the different loans. In the amortization tab enter the mortgage amount, payment amount, payment frequency, and rate of interest. In case of any prepayment, enter the prepayment type, amount, and the prepayment period. The results display the amortization period, interest over term, balance owing at term, and total interest. 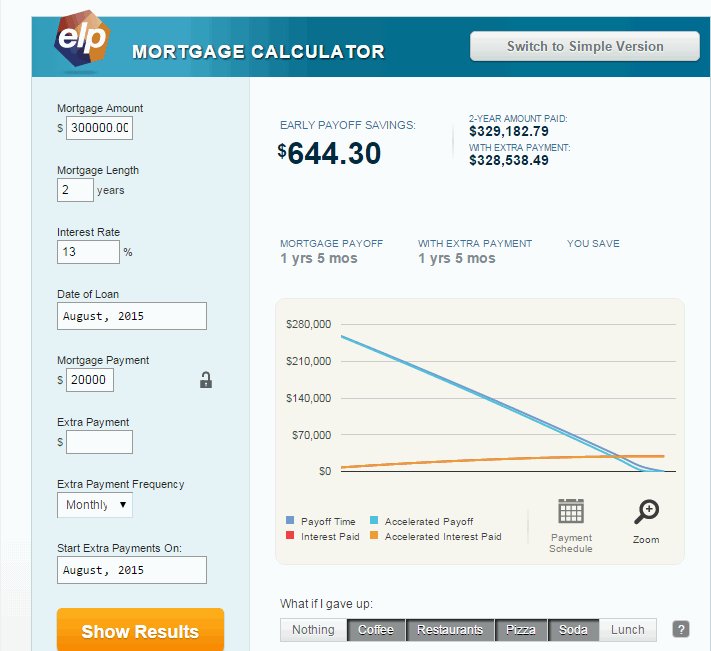 Also the total saving, savings over term, and mortgage free earlier is displayed in case you enter the prepayments. The output can be generated as a graph as payment over time, and outstanding mortgage balance, when the button view graph is clicked. 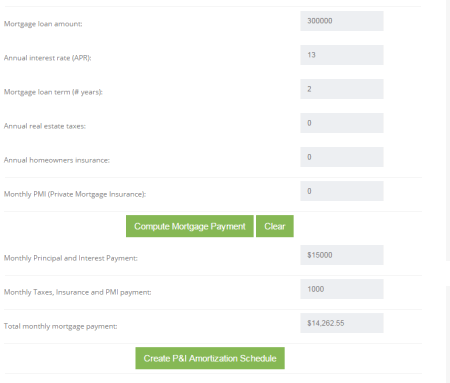 On clicking the hide report button, the amortization table is generated where the options can be used to display the amortization by year, amortization by payment period, and mortgage by payment period. 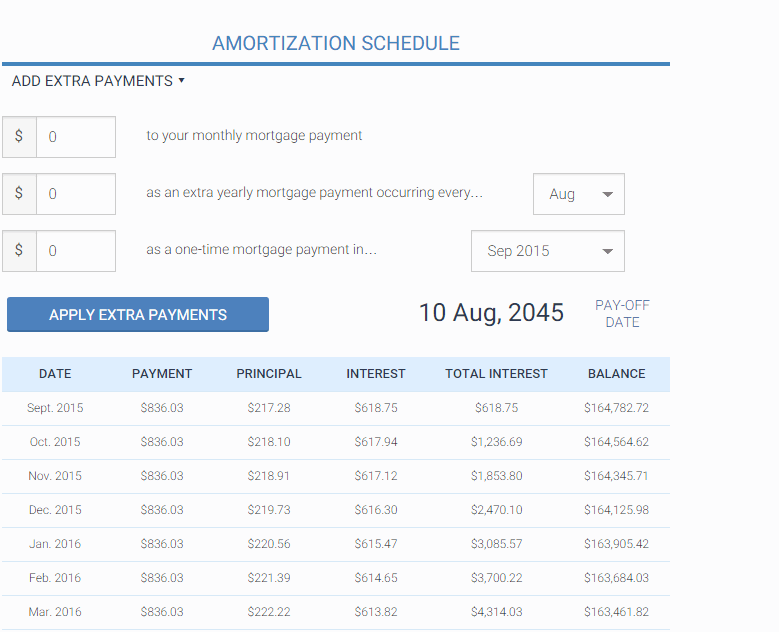 The amortization schedule displays the payment, principal, interest, balance, and prepayment. The printout of the generated results can also be taken, and the result can be shared, and saved. On clicking the button save/share results, the link is generated which can be used to view the results any time for quick access. DAVE RAMSEY is a website providing help and hope in the fields of life, money, business, leadership, kids, and school curriculum. 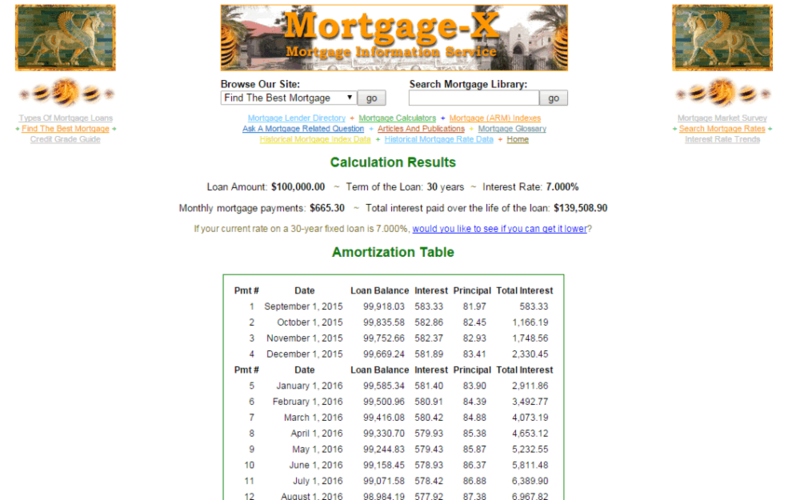 Among many tools, there is a tool to calculate the mortgage amortization. Firstly you have to answer the question: Do you know the original loan amount? In case you know the loan amount enter it, choose the loan issue date, loan term, loan interest rate, and any extra payment if desired to be paid after the payment is displayed. In case you don't know the loan amount, enter the current monthly payment, pay-off amount, annual interest rate, and extra payment if any. You can use either the simple version of the calculator, or the nerd version. 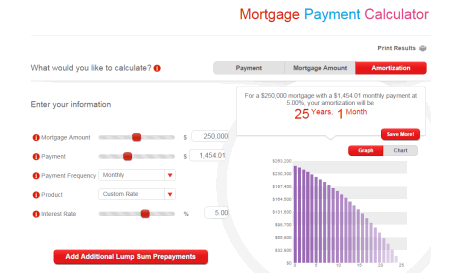 In the nerd version you can select the extra payment frequency option, and also edit the mortgage payment amount. On clicking the button show results, the total payment details is generated. In the graphical interface the pay-off time, interest paid, accelerated pay-off, and accelerated interest paid is displayed. On clicking the button payment schedule the standard payment schedule is generated, showing the monthly payment, interest, principal, and balance. When you choose to show the payment schedule with extra payment, it displays monthly payment, interest, principal, extra payment, and remaining balance. KANHAWAKE is a website to meet the requirements of the people of KANHAWAKE. One such tool is the mortgage calculator with amortization schedule. One of the most interesting feature of this amortization calculator is that you can either enter the principal and calculate the monthly payment, or vice versa. Enter other details like amortization duration, interest rate, and payment frequency, which can be either annual, semi-annual, weekly, bi-weekly, monthly, accelerated weekly, and accelerated bi-weekly. Click on the button calculate payment, or calculate payment as per your choice. The result displays the amortization duration, payment amount, and total interest. 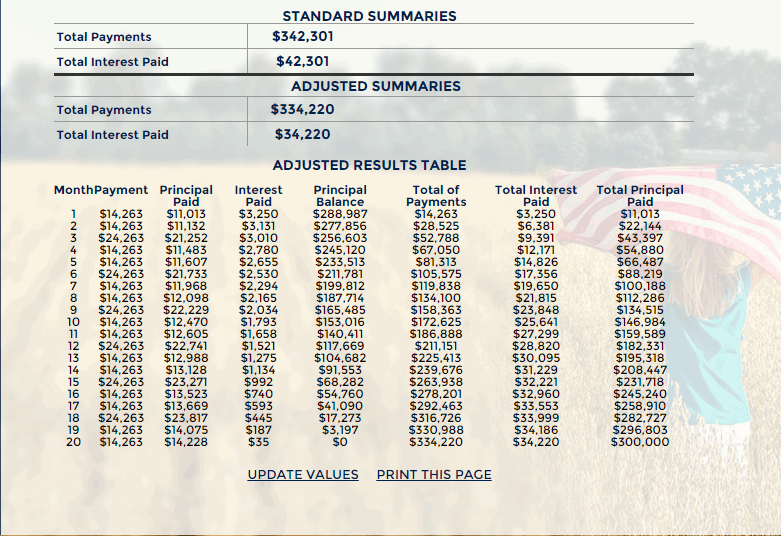 The amortization table displays the principal balance, capital paid, total capital, interest paid, and total interest. Fiscal Agents is a website developed with the sole aim of providing their customers better access to their customers, one such tool being the mortgage amortization schedule generator. Enter your loan details, like: amount to borrow, term length, amortization length, and payment frequency. You can choose the rate of interest from a set of rates, or enter your own rate. Select the loan start date, and the option whether to show the year to date totals at the end of the calender year, or the end of the term year. 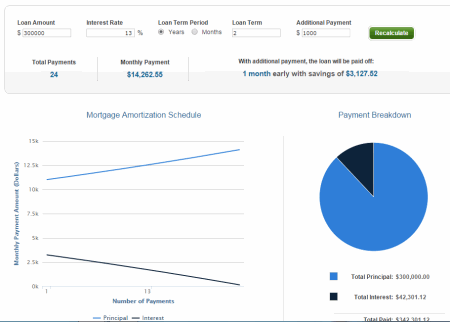 On clicking the create report button, the mortgage amortization schedule report is displayed. The date of the payment, principal, interest, and the remaining balance is displayed. The printout of the amortization schedule can be generated. eloan is a website to help you find the loan best suited for your needs. It has numerous tools to help you decide to do so, one of it being a visually aesthetic amortization schedule calculator, which is also very easy to use. Enter the mortgage details, like: mortgage amount, mortgage term, interest rate, and prepayments if any, using the sliders or the text box. Click on the show report button, after which the amortization table is displayed. The mortgage summary displays the total amount paid, and the total interest paid. 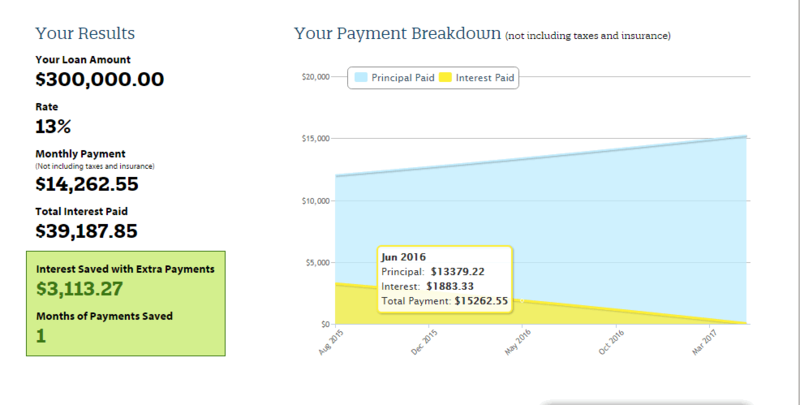 In the prepayment summary, the prepayment amount, start with payment, total payments, total interest, interest savings, and mortgage paid off duration is displayed. This gives an idea of the benefit of payment of the additional payment in the amount of savings. 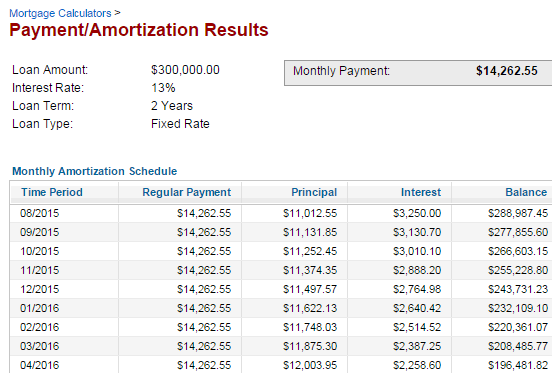 The amortization schedule displays the payment, principal paid, interest paid, and the remaining balance. The distribution of the principal, and the interest is also displayed in a graphical format. The print out of the generated result can be taken for future reference. U.S. MORTGAGE CALCULATOR has a beautiful, and easy to use Mortgage Calculator with taxes, insurance, and EMI. Input the loan data details, like home value, down payment, mortgage amount, interest rate, amortization period, property taxes/year, PMI/year, home insurance/year, HOA fees/month, and start month and year. Any monthly, yearly, half-yearly, quarterly, and one time extra payment can be added in the extra payments. The charts of the total monthly payment is displayed, showing down payment, principal, extra payment, interest, taxes insurance, and fees is displayed, along with the total of all payments. 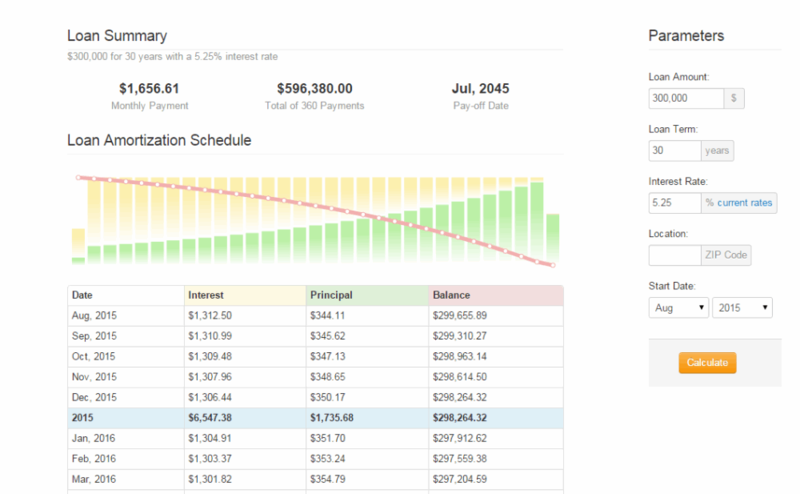 The graph of the mortgage payment schedule is also displayed showing the principal, extra payments, interest, taxes, insurance, fees, and balance. The extra payment result displays the amount, monthly extra payment, property taxes, home owner insurance, PMI, and HOA fees, along with total monthly payment. The amortization schedule displays the principal, interest, taxes, insurance, fees, total payment, balance, and loan paid to date in a yearly view. On clicking over any year, the monthly amortization schedule for that year is displayed. 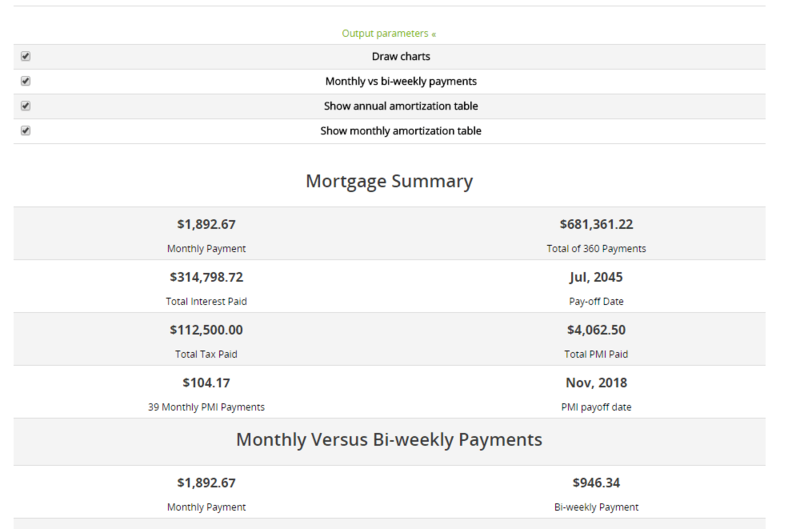 The monthly versus accelerated bi- weekly mortgage payment is also displayed, showing the comparison between the payment frequency of the monthly and accelerated bi-weekly payment displaying: number of payments per year, amount paid towards loan, total payment, total interest paid, and amortization term in years. MOOLANOMY being a personal finance online magazine provides financial information. 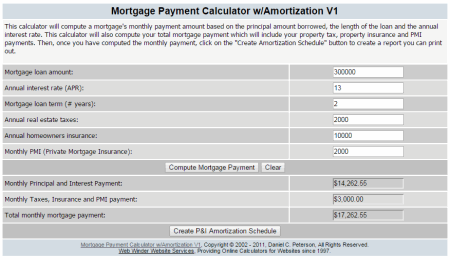 In order to help it's visitors, a free mortgage calculator with loan amortization schedule is also displayed. Enter your mortgage parameters, like: loan amount, interest rate, loan term, property tax, and PMI. Select the output parameters to be displayed, like: charts, mortgage summary, monthly versus bi-weekly comparison, annual amortization, and monthly amortization. Clicking the calculate button displays several results in different forms. 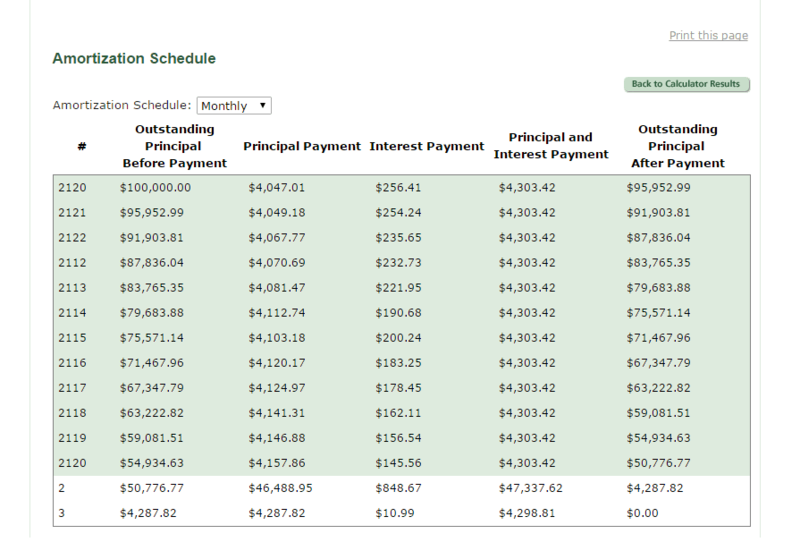 The repayment chart displays the payment contribution towards interest, tax, PMI, and principal. The balance graph displays the remaining principal balance at the end of each year. The mortgage summary displays the payment, total interest, property tax, total tax, PMI rate, and total PMI paid. The monthly versus bi-weekly payment display the benefits of the weekly payment schedule, displaying the difference in monthly, and bi-weekly payment, total interest paid in both the cases, and total interest savings. The amortization schedule displays the interest, principal, and balance. 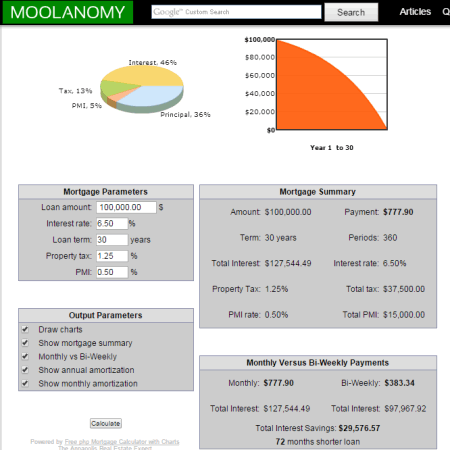 Mortgage Calculators is a very beautiful and simple website hosting a total of 11 mortgage calculators. One among them is the advanced mortgage calculator, which is a repayment calculator with graphs and amortization tables. Enter your loan details like credit profile, home value, loan amount, loan purpose, interest rate, loan term, start date, property tax, and PMI. A list of the output parameters can be selected to display or hide: charts, monthly versus bi-weekly payment, annual amortization table, and monthly amortization table. The amortization graph, and the repayment chart displays the principal, interest, tax, and PMI. The balance graph displays the balance plotted against the year. On calculation, the mortgage summary shows: monthly payment, total interest paid, total amount paid, pay off date, total tax paid, total PMI paid, monthly PMI installment, and PMI pay-off date. The monthly versus bi-weekly payment displays: monthly payment, bi-weekly payment, monthly pay-off date, bi-weekly pay-off date, total interest paid, and the total interest savings. The amortization schedule display the interest, principal, and balance. LendingTree helps its website visitors to find the perfect mortgage from a list of multiple available loan offers for their requirements. 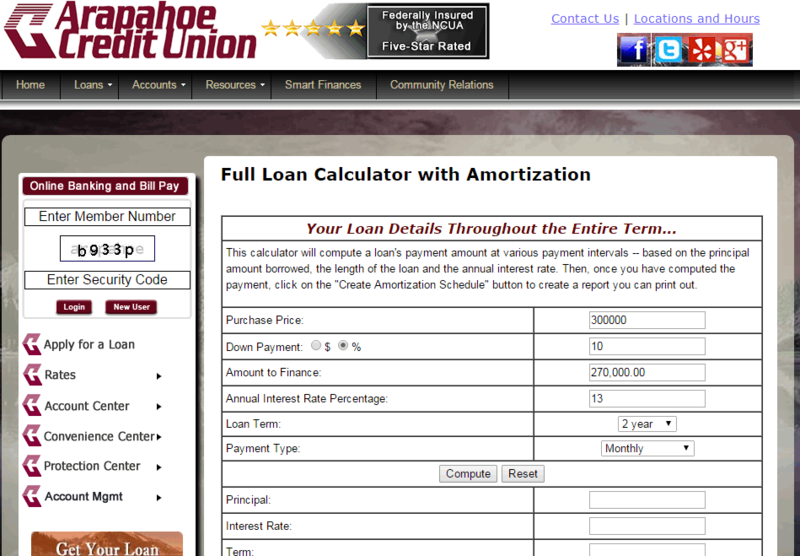 This website also features a loan payment amortization calculator with a sleek interface, and is quite easy to use. Enter your loan amount, interest rate, and loan term, after which the monthly loan payment is displayed. 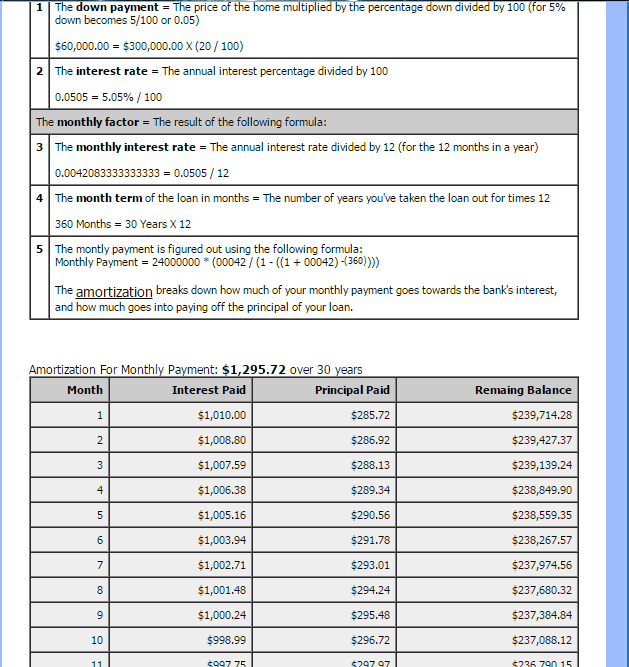 The amortization table displays the monthly payments broken down in the form month of payment, payment amount, principal, interest paid, total interest, and balance remaining after the payment. Pine Grove Software is an amortization schedule calculator website with a very simple and easy to use interface. In the page displayed, you have to enter the details of amount of loan, annual interest rate, periodic payment, and number of payments. Out of these parameters, the entity which is to be calculated must have zero as its value, and only one entity can be left out. Also, you can select the option to select the loan date, first payment date, payment frequency, compounding period, points, and amortization method. When you click on the Calc button, the missing term is calculated, and the amortization table is generated displaying payment term, date, payment, principal, interest, and balance. There are several other buttons to clear the entered data, take a print preview, print the generated data, and view the charts displayed. The charts in graphical form display the annual principal and interest totals, accumulated principal, interest with remaining balance, total principal, and interest in a very easy to understand graphical format. When you hover the mouse on the graph, various details are displayed with their data values. Visual styles, currency, and conventions can also be changed with the click of a mouse. Mackenzie INVESTMENTS hosts a very simple, easy to use, and feature rich amortization scheduler. Just enter the loan details, like: loan amount, interest rate, advance date, interest adjustment date, and first payment date. 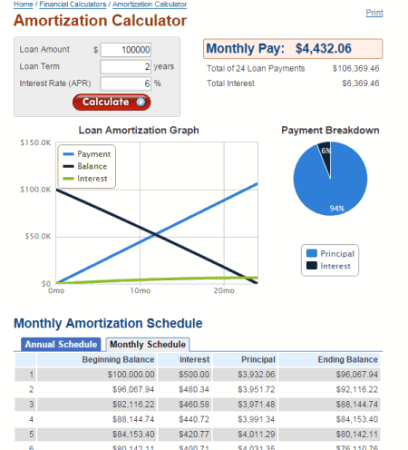 The best feature available in this amortization scheduler is that you can choose a number of options on different items, like: compounded duration (monthly, quarterly, S-annually, or annually), payment type (blended, or interest only), payment frequency (acc weekly, weekly, acc bi-weekly, bi-weekly, s-monthly, monthly, quarterly, s-annually, or annually), and amortization term (months, or years). Several prepayments can also be added to pay-off the loan as early as possible. Pre-payments can be added as annually as a fixed amount, percentage, or increase the payment amount to a certain amount. Any lump sum payment at any other time can also be added at a particular time, week, or month. Based on these values, the amortization table is generated which displays the due date, payment, principal, interest, and balance. Also, in the end, the term totals of payment, and interest is generated. 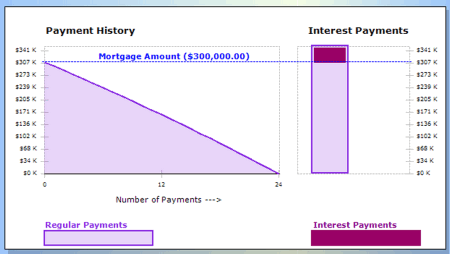 On clicking the graph tab, the graph of the mortgage balance is displayed, showing principal portion versus interest portion in the payment breakdown tab, and the balance in balance tab. The report generated outlines the main points of the loan, and the payment details. 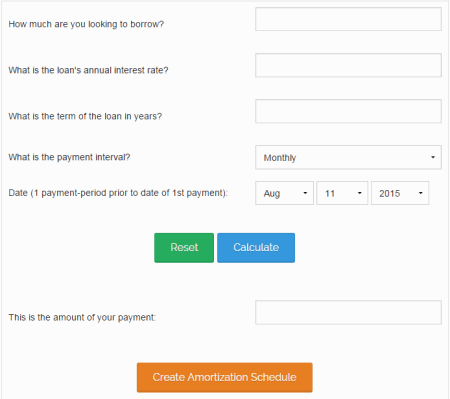 INDEPENDENT BANK lets you generate the amortization table for your loan. Just enter your loan details like principal balance, interest rate, and loan term. After clicking the calculate button EMI payment, total payment, total interest paid, and the amortization table is generated. In case you choose to make some extra payments, you can choose from irregular and periodic options. In case you select the option to choose periodic payment, you can select from either the monthly, quarterly, annually, or semi-annual payments. In case of irregular payment you can select the new payment start, new payment end, and additional payment amount. In case of extra payment, additional options like principal balance, interest saved, years saved on mortgage, and total years to pay-off is displayed. Under the standard summaries tab, the new payment total, total interest paid is displayed along with the differences shown. 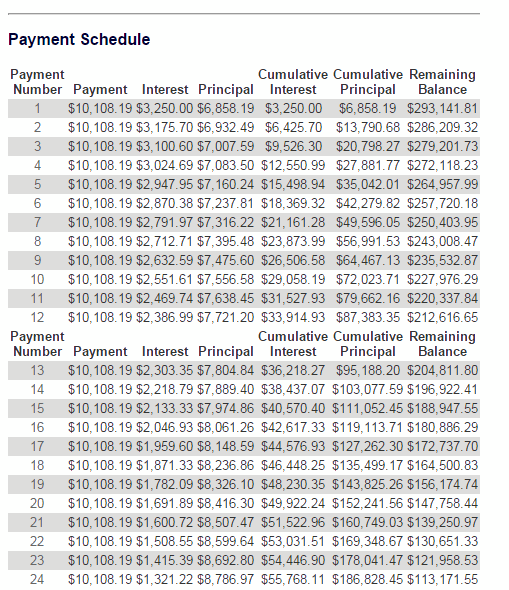 The amortization table display the payment amount, principal paid, interest paid, principal balance, total of payments, total interest paid, and total principal paid. The printout of the displayed result can also be taken. An easy to use car loan amortization schedule calculator is available on Austin Bank website. Just slide the slider to select your loan details, or insert it into the boxes provided. You can choose the option to calculate for either the monthly payment, or the purchase price by choosing the appropriate radio button. You have to enter the details of your car loan amount like loan amount, monthly payment, loan term, and interest rate. In the down payment tab you can enter the down payment amount, trade allowance, and the amount owed on trade. Any details of the taxes, can be entered. On clicking the button show report, a wide range of information is displayed in the form of charts, graph, and amortization table. 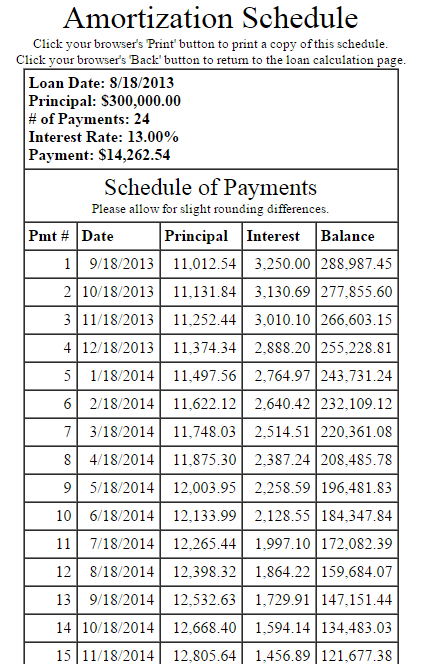 The detailed summary displays the amount financed, monthly payment, total payment, and total interest paid. 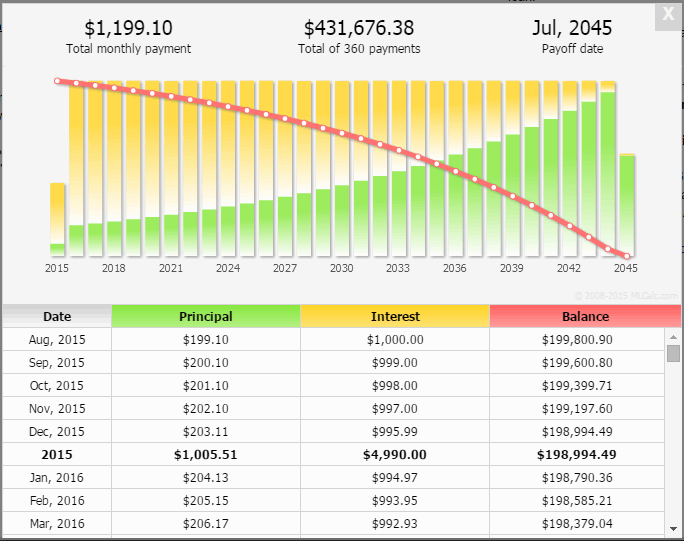 The amortization chart displays the payment, principal, interest, and balance. The graphs display which ways the loan term, and the down payment affect the payment. UNITED BANK OF UNION hosts an amortization schedule calculator that calculates the amortization schedule based on 365/360 schedule of the US rule. Here you can choose from different loan options, like: instalment, balloon, interest only, and principal + interest. After selecting the loan type, select the amount of loan, interest rate, loan term, amortization term, and interest only term using sliders, or inputting data in the text box. Choose the finance start date, and the first payment date. 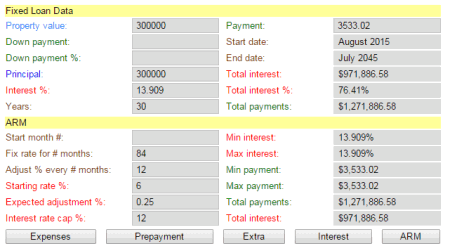 As you move the slider, the final payment date, monthly payment, total interest paid, and total payments is generated. A graph is also generated which shows the balance remaining after a given payment number. When you click on the view report button, various other details like amount financed, loan date, maturity, loan term, disbursement date, repayment schedule, interest rate, and calculation method is displayed. 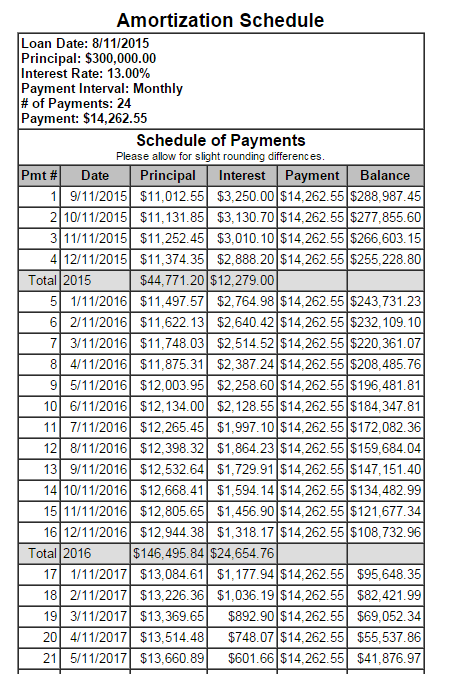 The amortization schedule is also displayed which shows the payment date, payment amount, interest paid, principal paid, and remaining balance. 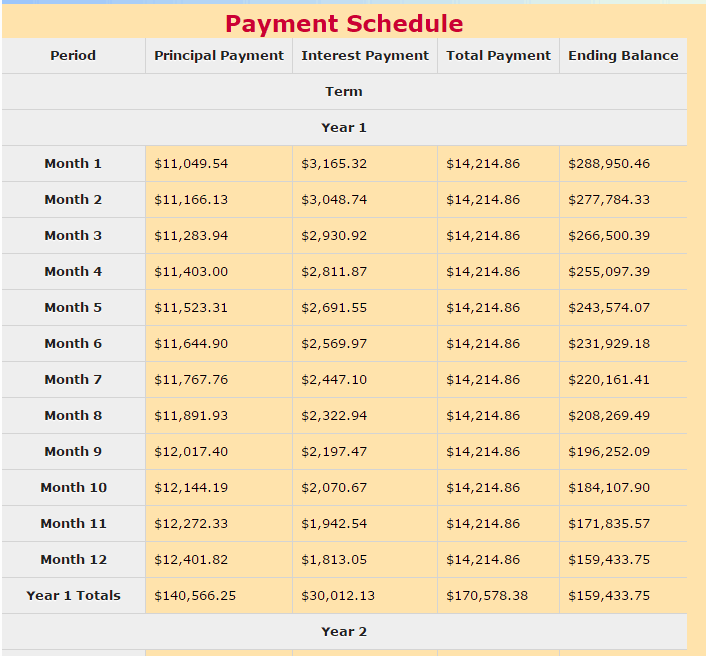 At the end of each year, and in the end, the total of payment amount, interest paid, and principal paid are displayed. Zillow being a popular name in itself needs no introduction. Along with offering different real estate and rental marketplace to its customers, it also features an easy to use mortgage calculator. Just enter the home price, down payment, and interest rate. Click on the advanced button, to input other options like loan term, property tax, home insurance, and private mortgage insurance. The payment breakdown is displayed in the form of circular ring highlighting different costs in different fields. 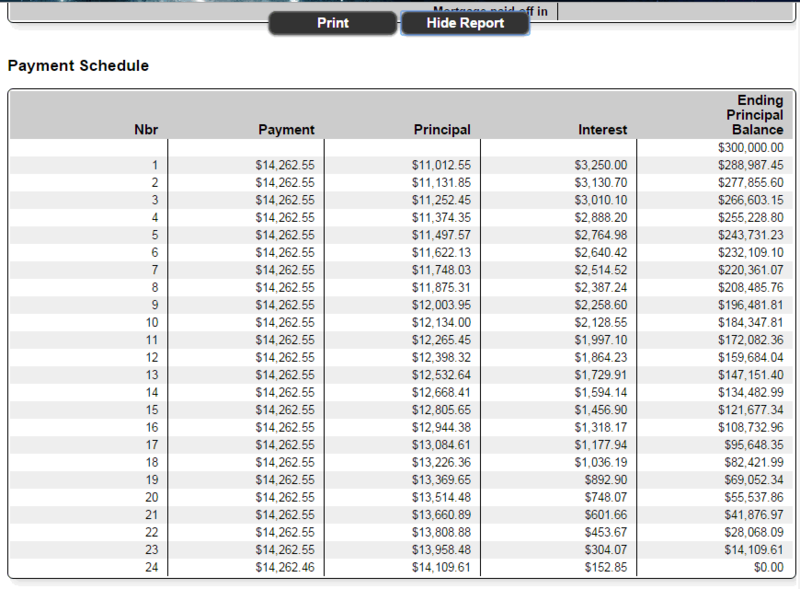 On clicking schedule tab, the details of the principal, interest, and remaining balance is displayed where the details can be easily viewed by hovering over the graph. On clicking the full report, a detailed report is generated. It contains an additional graph displaying the principal and interest. 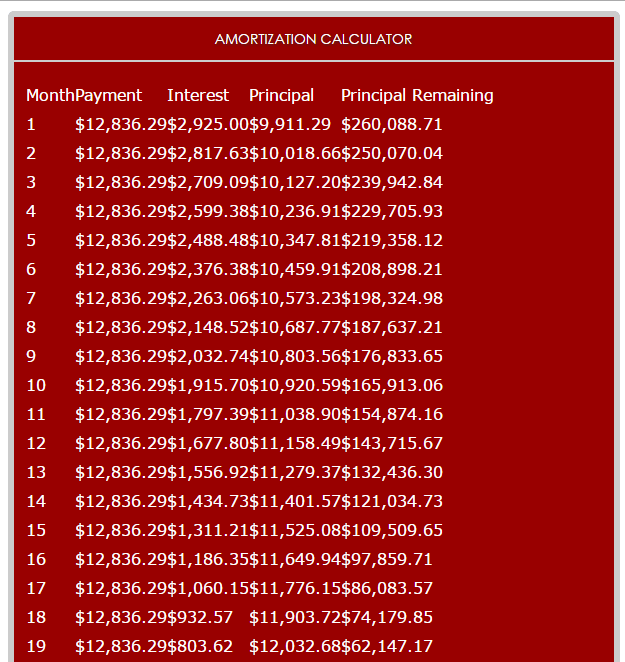 The amortization schedule display the amount paid, principal, interest, and the remaining principal. 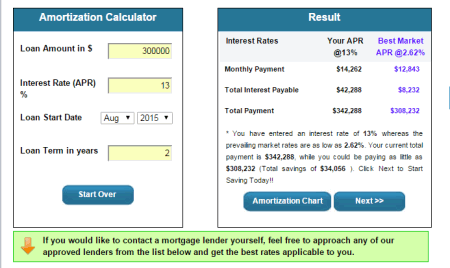 OnlineLoanCalculator.org features a very beautiful and feature rich loan amortization calculator. Enter your loan details, like: purchase price, down payment, trade in value, interest rate, loan term, sales tax, and start date. On clicking the output parameters, you can choose the options that are to be displayed, like draw charts, monthly versus bi-weekly, annual amortization table, and monthly amortization table. 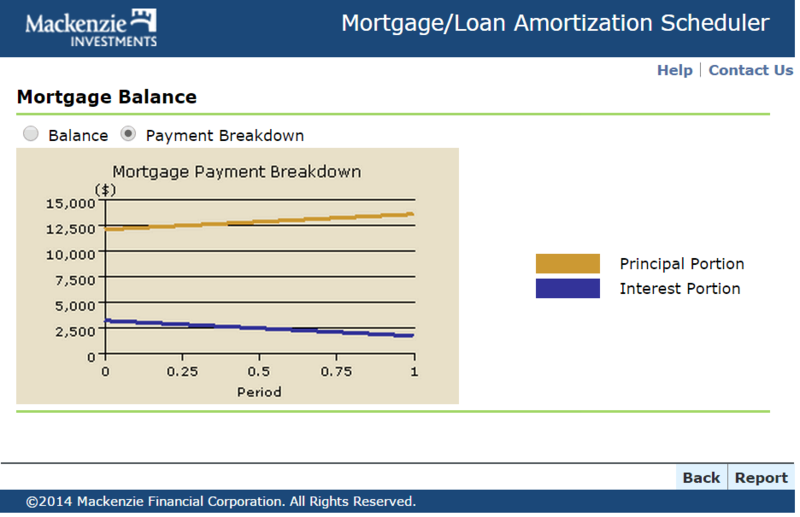 At the top of the amortization graph, balance graph, and repayment chart are displayed. In the loan summary, the details of monthly payment, total amount paid, total interest paid, and pay-off date are displayed. In the monthly payment versus bi-weekly payment the details, and the difference between the two are highlighted. It covers the details of payable amount, pay-off date, total interest paid, and total interest savings is displayed in the yearly amortization schedule, and the monthly amortization schedule the details of interest, principal, and remaining balance is displayed. OPTION1 has a free loan amortization scheduler application which is used to generate amortization schedule for your loan. Just enter the loan details using the slider, or entering the values in the text-box. It can be used to calculate payment amount, or the loan amount. Enter the loan amount, or monthly payment, interest rate, and loan term in months. Based on the entries, it calculates the loan amount, or monthly payment, total interest paid, and total payments. 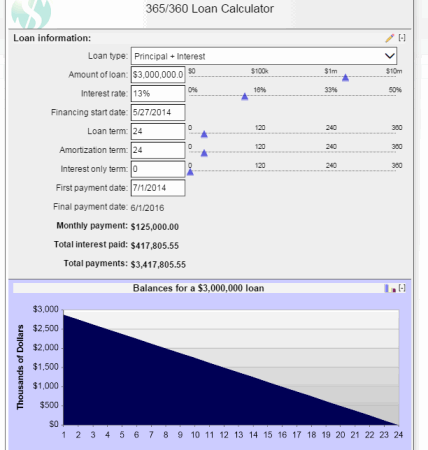 In the displayed graph, the balance remaining for the loan amount is displayed. On clicking the button view report, the graph is displayed, showing the principal, versus interest. 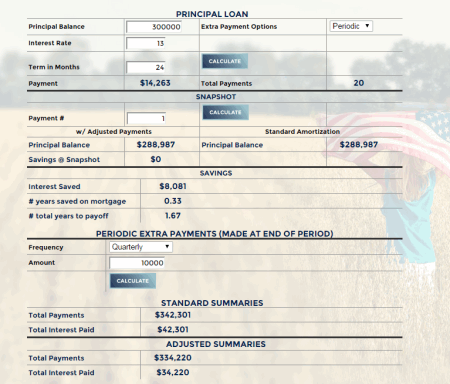 The payment schedule displays the payment amount, principal paid, interest paid, and the loan balance. The printout of the generated amortization schedule can also be taken. TD Bank Group along with offering various financial products, also features a mortgage payment calculator on their website. Just enter your mortgage details, like: mortgage amount, payment frequency, interest rate, and amortization period. In case of any additional payments if any, they can also be entered. You can also compare up to three different mortgage options, and choose the option which is to be highlighted first. 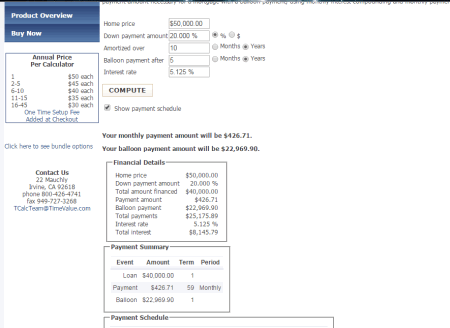 On clicking the calculate button, the mortgage payment, insurance payment, and total monthly payment is displayed. Along with it, total amount payment for the term, total principal repayment for the term, total interest cost for the term, and the balance at the end of the term is displayed. 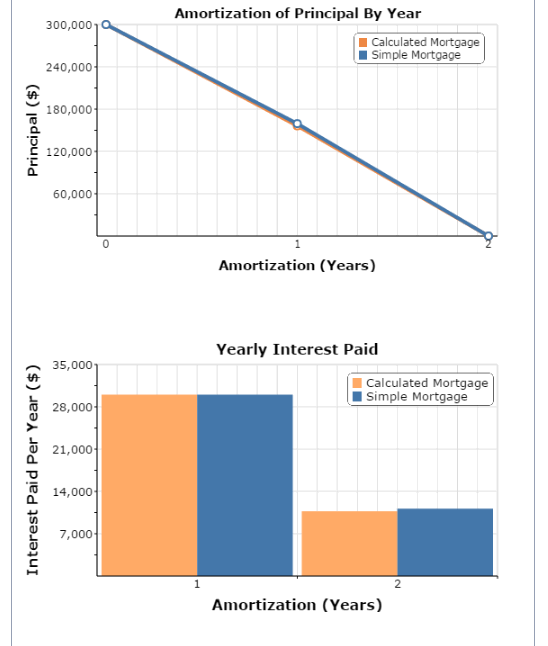 A mortgage amortization graph is also displayed, plotted against mortgage amount, and the year. On clicking the amortization schedule button the amortization schedule is generated displaying the outstanding principal before payment, principal payment, interest payment, amount paid, and outstanding principal after payment. These can be seen in both the monthly, and annual view. While comparing various mortgage just enter the loan details of various different aspects of loan, and payment details, after which the difference between the mortgage payment, insurance payment, total amount payment for term, total principal repayment for term, total interest cost for term, balance at the term's term, and the annual mortgage insurance cost. Thus, different loan details can be calculated, and appropriate decisions can be taken. DINKYTOWN.NET has a visually aesthetic amortization schedule calculator, which is also very easy to use. Enter the mortgage details like mortgage amount, mortgage term, interest rate, and any prepayments if any, using the sliders or the text box. Click on the show report button after which the amortization table is displayed. The mortgage summary displays the total amount paid, and the total interest paid. In the prepayment summary the prepayment amount, start with payment, total payments, total interest, interest savings, and mortgage paid of duration is displayed. This gives an idea of the benefit of payment of the additional payment in the amount of savings. 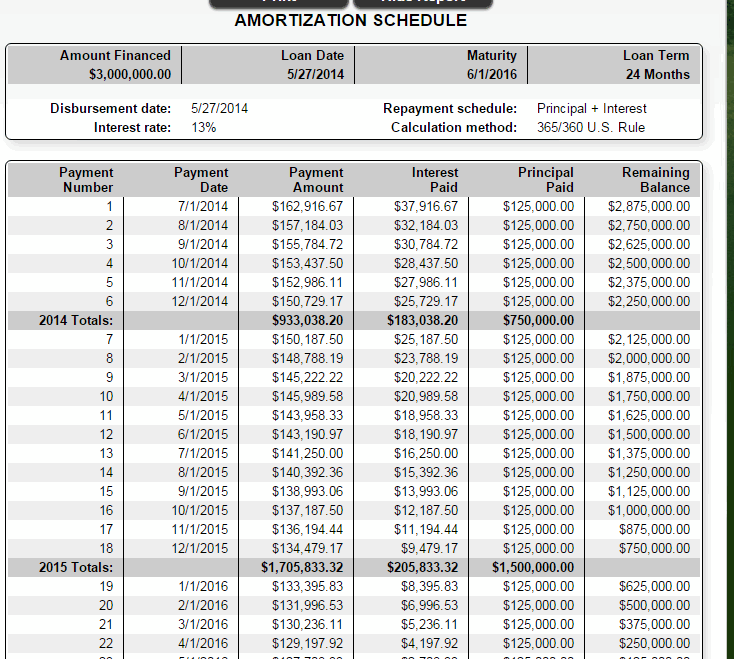 The amortization schedule displays the payment, principal paid, interest paid, and the remaining balance. The distribution of the principal and the interest are also displayed in a graphical format. The print out of the generated result can be taken for future reference. Financial Consumer Agency of Canada works to protect and inform customers of financial services and products. In order to do so, it also features a mortgage calculator tool. Just enter the loan details, like: mortgage amount, interest rate, amortization period, payment frequency, and loan term. You can also choose a prepayment plan either one time, monthly, or annually. 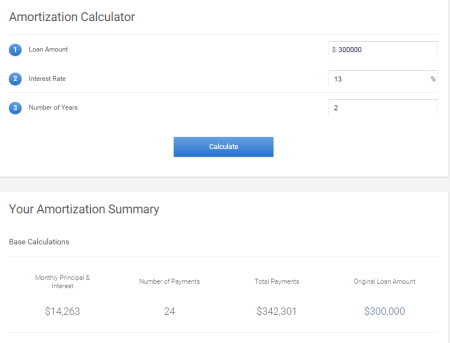 On clicking the calculate button, the calculation summary is generated showing the number of payments, mortgage payment, prepayment, principal payment, interest payment, total cost, and interest saving with prepayment plan. The mortgage summary highlights the major features of the mortgage. The payment diagram displays the payment history, highlighting different options, like: regular payments, prepayments, and interest payments. On clicking the summary reports, an additional amortization table is displayed, showing the payment period, principal payment, interest payment, total payment, and the ending balance. 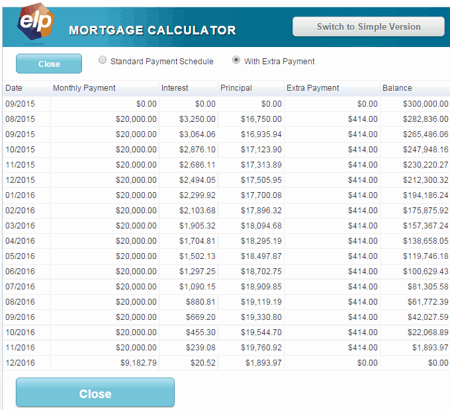 Calculators 4 Mortgages is a free to use website, featuring many mortgage calculators. One of them is amortization schedule calculator. Input the loan details, like: loan amount, interest rate, loan start date, and the loan term. On clicking the calculate button the comparison is done between the best market rate available, and your rate of interest. The result displays the comparison of interest rates, monthly payment, total interest payable, total payment, and total savings. On clicking the button amortization chart, amortization chart are generated showing the principal payment, interest payment, principal balance, and total paid of both the input interest rate, and the best market interest rate. LoanDepot is a mortgage, and non-mortgage loan provider. Along with various other services provided, it also has a visually aesthetic amortization schedule calculator. Enter the mortgage details like mortgage amount, mortgage term, interest rate, and any prepayments if any, using the sliders, or the text box. The prepayments can be either one time, monthly, or yearly based on your choice. Based on the calculations, the graph is generated showing the total payments, and the mortgage term principal balance by year. 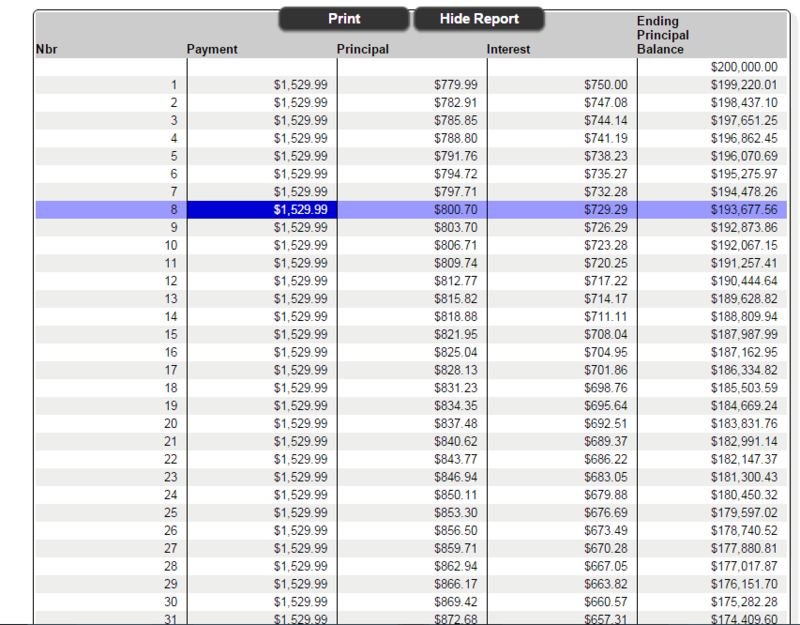 Click on the show report button, after which the amortization table is displayed. The mortgage summary displays the total amount paid, and the total interest paid. In the prepayment summary the prepayment amount, start with payment, total payments, total interest, interest savings, and mortgage paid of duration is displayed. This gives an idea of the benefit of payment of the additional payment in the amount of savings. 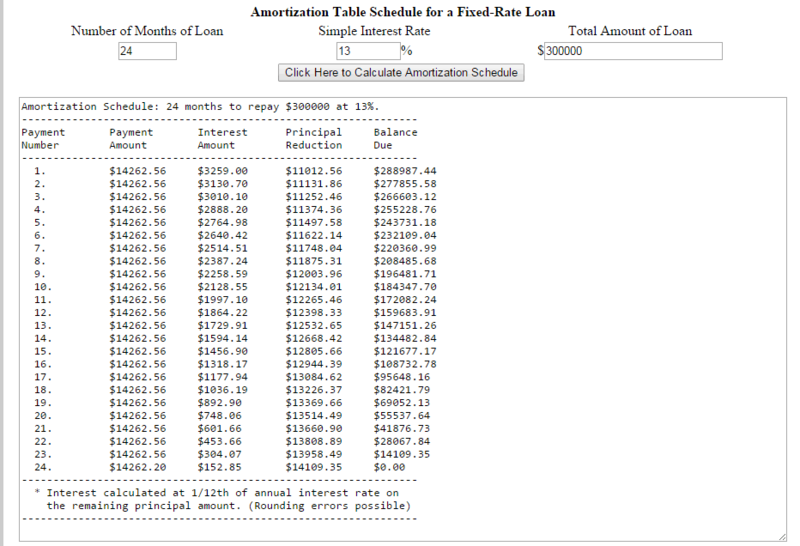 The amortization schedule displays the payment, principal paid, interest paid, and the remaining balance. The distribution of the principal, and the interest are also displayed in a graphical format. The print out of the generated result can be taken for future reference. Quicken Loans is a online lender website, and provides various facilities to the customers. It features a number of calculators, one among them being amortization calculator. Some of the necessary details that is compulsory to be entered are: loan amount, loan term, interest rate, and the state. In case you want to add any extra payments to your loan, it can be entered as a monthly, one time, or annual payment. Enter the additional payment amount, and the start payment date. 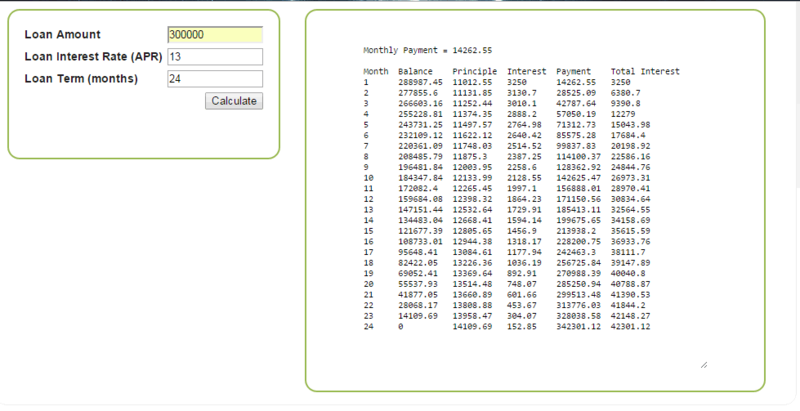 On clicking the calculate button, the results are generated displaying the monthly payment, and the total interest paid. In case you have entered any extra payments, the interest saved with extra payments, and the months of payments saved is displayed. 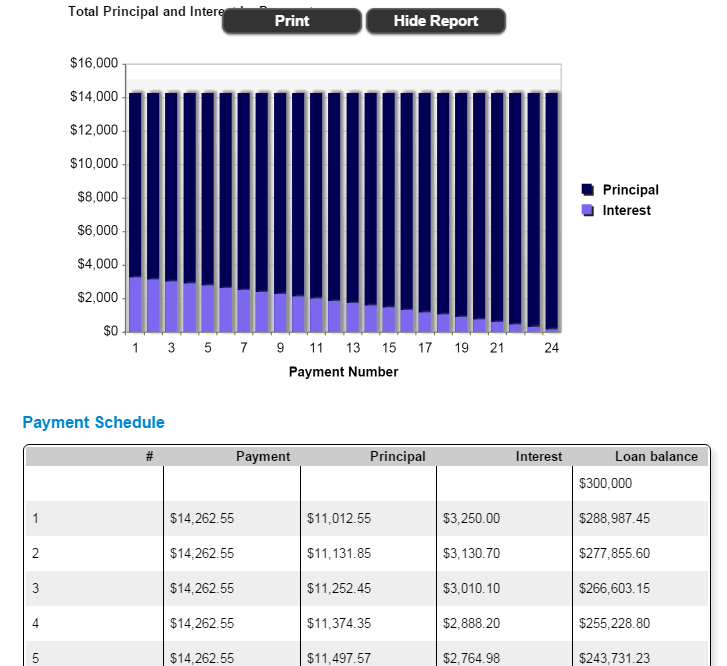 Although the amortization table is not generated,the payment breakdown graph is displayed showing the principal paid, and the interest paid which can be turned on or off. 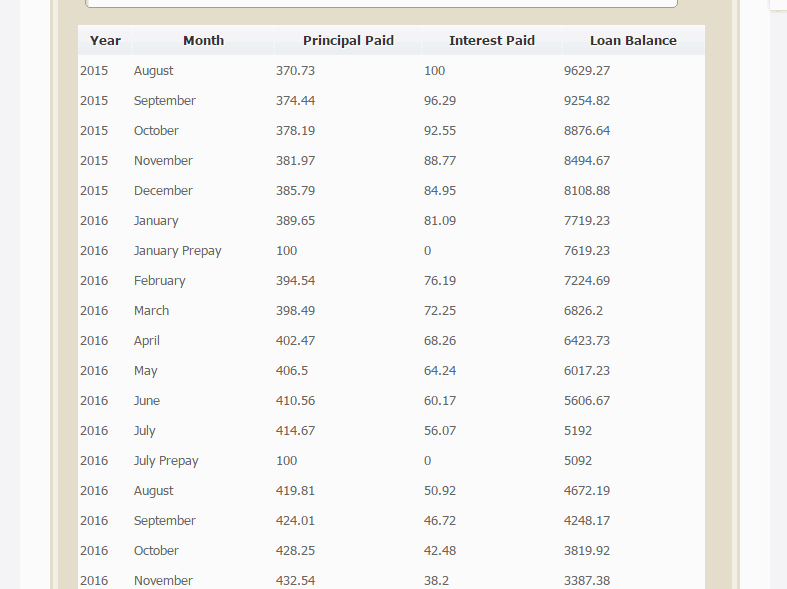 When you hover over the graph, the payment month, principal, interest, and total payment are displayed. CROWN provides support to manage the finance, work, life, and also feature a mortgage payment calculator with amortization to be used to create your payment schedule of the mortgage. Enter your payment details like the mortgage loan amount, annual interest rate, mortgage loan term, annual real estate taxes, and the monthly PMI (private mortgage insurance). 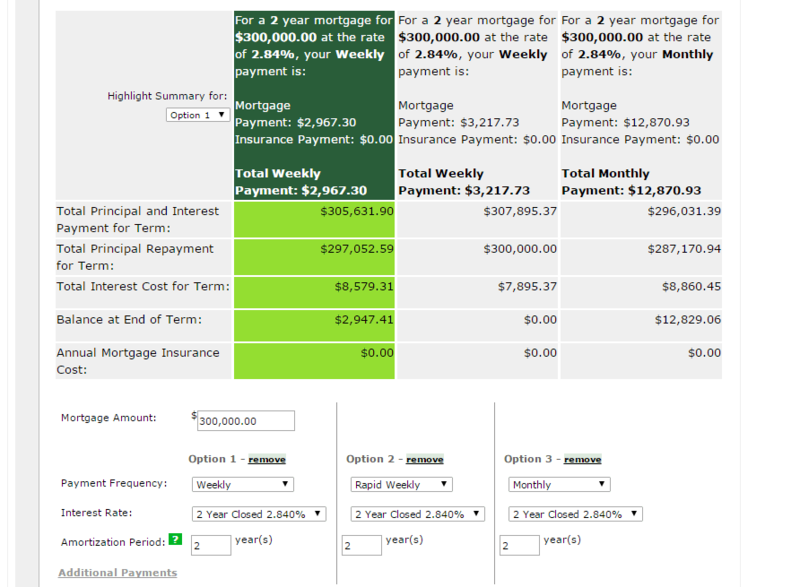 On clicking the button compute mortgage payment, the monthly loan payment, monthly tax, insurance, and PMI payment, and total monthly mortgage payment are displayed. On clicking the button create P&I amortization schedule, the amortization schedule is generated displaying payment date, principal, interest, payment, and balance. 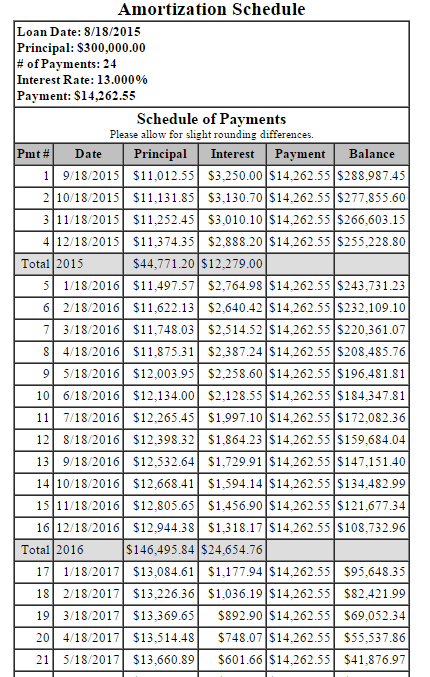 At the end of each payment year the sum of principal, and interest is displayed. In the end of the final payment, sum of principal, interest, and payment is displayed. LoveToKnow is an online media company which provides useful information to the people. Among all the information, one is an amortization schedule calculator. Enter the loan details, like: principal loan amount, interest rate, loan term, starting month, and starting year. Click on the calculate button to generate the amortization schedule showing month of payment, year of payment, principal, interest, and remaining balance. 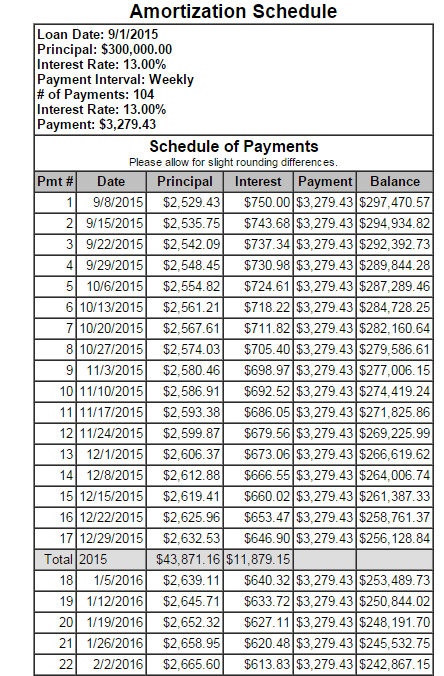 In the lower most part of the amortization schedule, the payment, total interest, and total payment is displayed. The printout of the generated amortization schedule can also be taken. CARRINGTON MORTGAGE SERVICES offers a number of services to it's customers, and one of them being an amortization mortgage calculator. It offers the user to choose from either the fixed rate, or the adjustable rate loans. Just enter the loan amount, interest rate, loan term, and loan type. 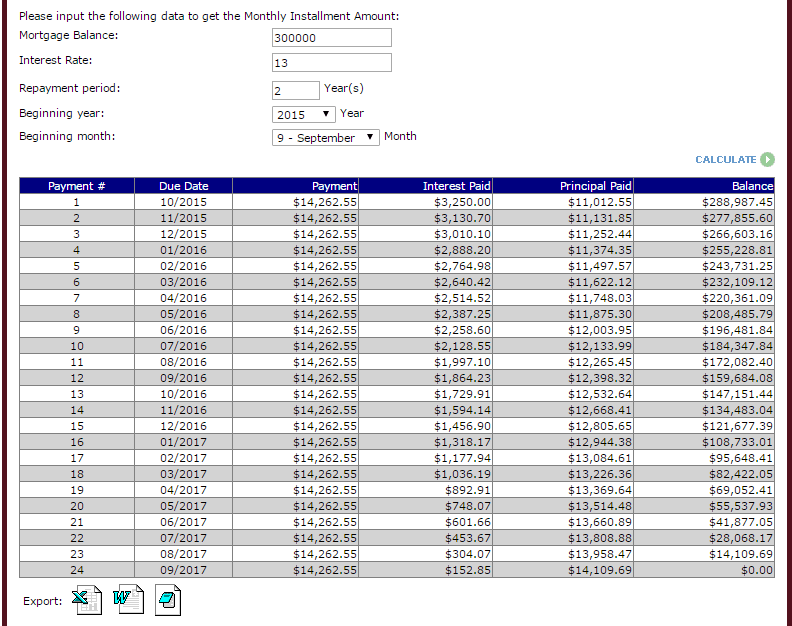 Choose the option to show the monthly, or yearly amortization table. Then the monthly payment is displayed. The amortization schedule displays the time period, regular payment, principal, interest, and balance. 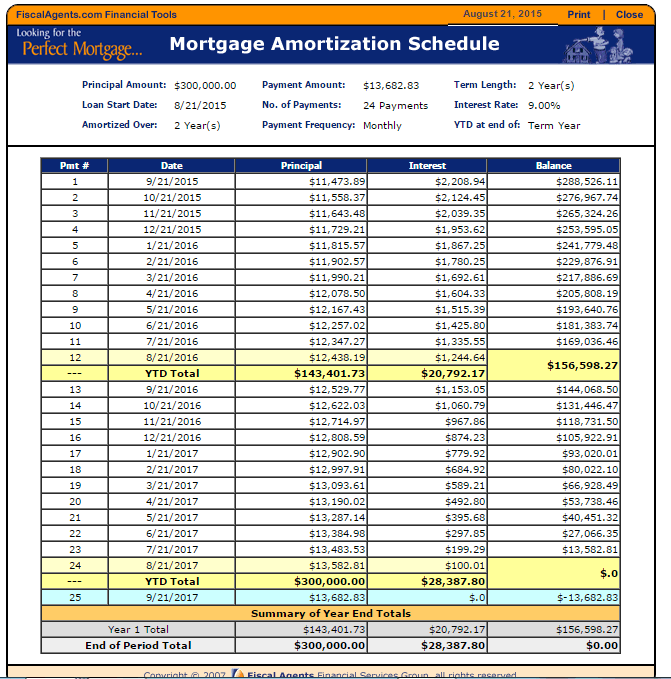 A printout of the amortization schedule can be taken as a reminder. 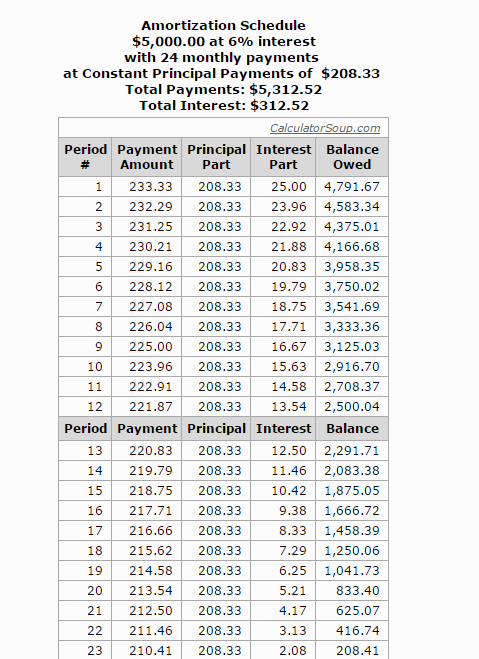 In the end, the grand total of the principal, interest, and amount paid is displayed on the table. Auto Loan Calculator is an aesthetically beautiful website to view the auto loan amortization schedule. 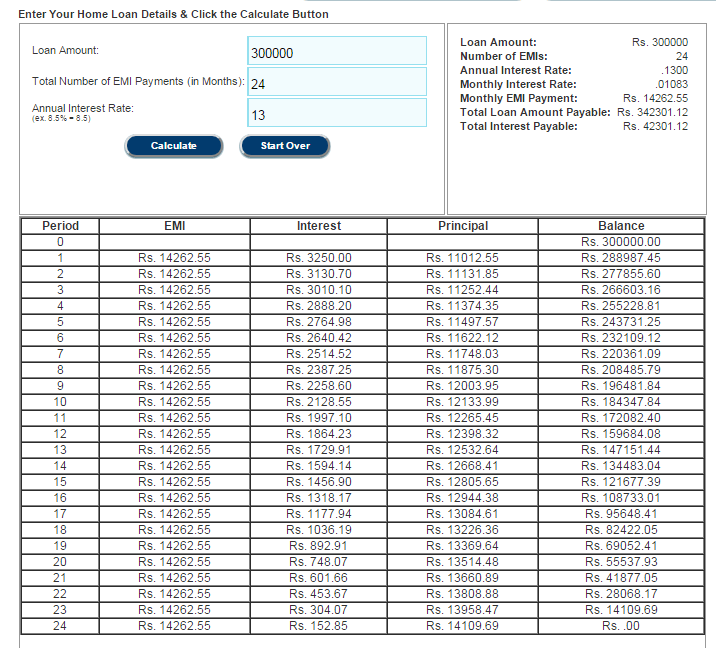 Input the loan details, like loan amount, loan term, interest rate, and the first payment date. The amortization schedule can be viewed as an yearly view, or the monthly view. 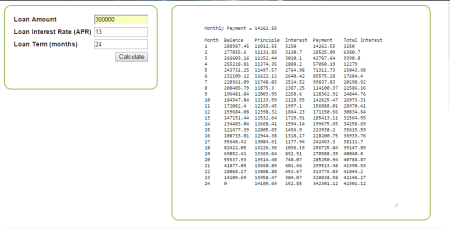 On clicking the calculate button the monthly payment, total of payments, and the final pay-off date is displayed. Balance, principal, and interest is displayed at the end of each year. 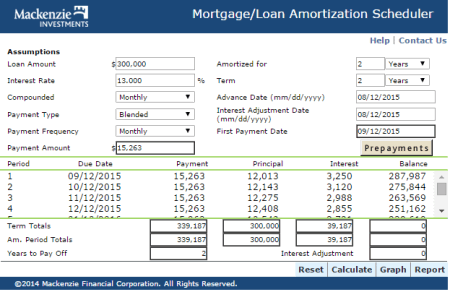 The amortization breakdown is displayed showing the date of payment, principal, interest, and the remaining balance. Also the lower rates of loan can be found out in different locations with a simple click of mouse. MSI is a website, which provides assistance for home ownership. Also featured on this website is a simple and easy payment schedule calculator. Enter the loan amount, interest, and loan term. On clicking the calculate button the payment result, and amortization schedule are generated. The payment result shows monthly payment, and total cost. 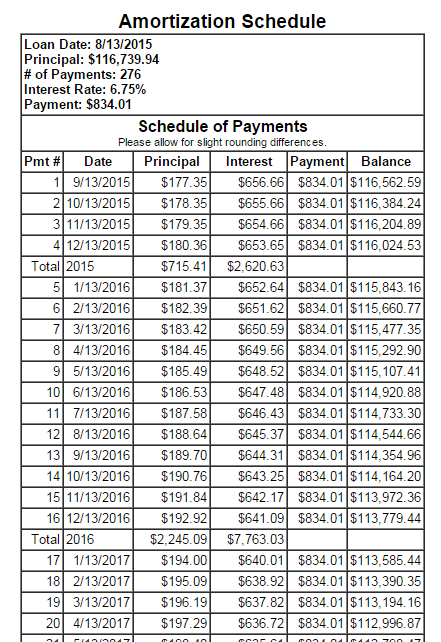 The amortization schedule is displayed annually showing the payment year, principal payment, interest payment, and balance. 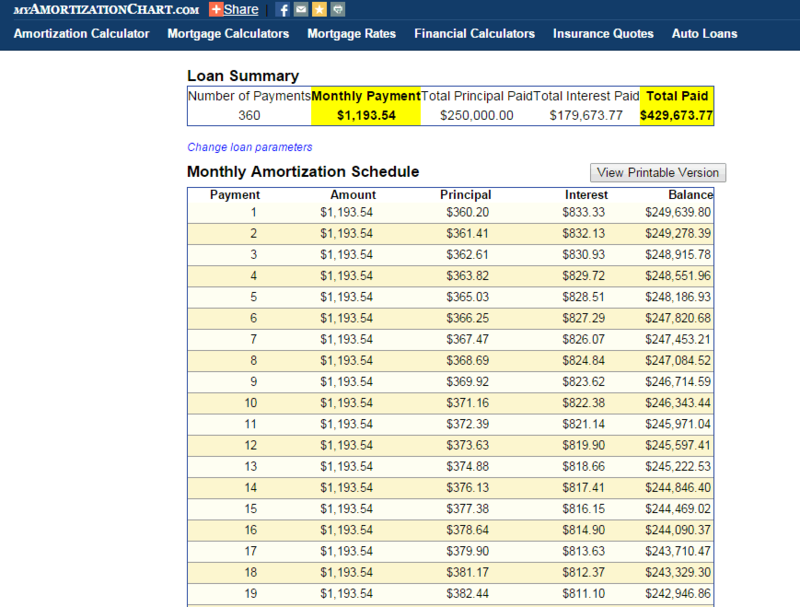 The amortization schedule for an year can be seen on clicking the view button in the monthly breakdown tab. The monthly amortization schedule display the payment month, monthly payment, principal payment, interest payment, and balance. 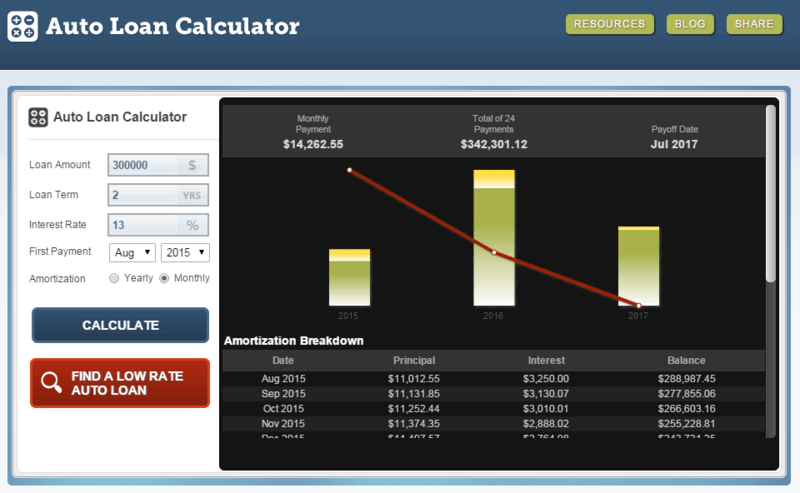 Amortization Calculator.net has a simple amortization calculator, which also includes the taxes, and insurance charges. Enter the details like loan amount, interest rate, lending term, and amortization schedule. In case of extra property information, input extra details like appraised home value, estimated property taxes, insurance taxes and PMI, annual property taxes, annual hazard insurance, and monthly private mortgage insurance. The loan amortization results display the monthly principal, interest payment, monthly property taxes, monthly hazard insurance, monthly PMI, and total monthly payment. The amortization schedule displays the beginning balance, interest, payment, and ending balance. The amortization equation to be employed is displayed at the lower most corner. 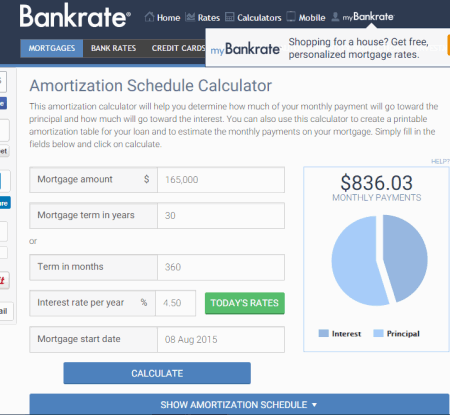 Bankrate provides you a very useful tool to carry out the task to prepare the amortization schedule. 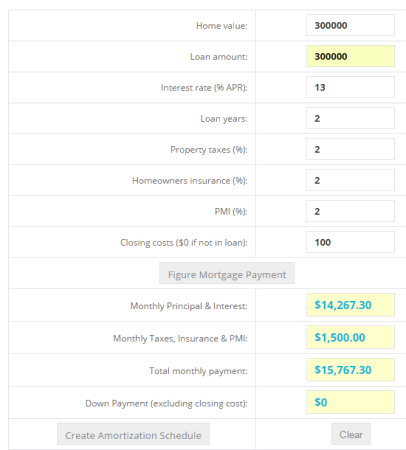 In the displayed page you have to simply enter the mortgage amount, mortgage term in years/months, interest rate per year, and mortgage start date. When you click on the calculate button, it displays the monthly payments, and the graphical representation of the principal, and interest. When you hover over the graph, it displays the amount spent on principal paid, interest paid, the percentage share of principal, and interest in the final payment. When you click on the option to show amortization schedule, the amortization schedule is generated, which shows you the date of payment, payment amount, principal, interest, total interest, and balance. Any extra payments can also be added to be paid on monthly, yearly, and one time basis. The printout of the amortization schedule can also be taken out. CANADA MORTGAGE.com is a very simple and feature rich website where you can easily create amortization schedule. You have to simply enter the loan amount, interest rate, extra monthly payment, extra annual payment mortgage term, amortization duration, and start month. You can either select the option to create schedule based on Canadian calculation (semi annual compounding), or US Calculation (compounding each period). The calculations display the monthly payments, principal paid, balance, extra per month, extra per year, and interest paid. 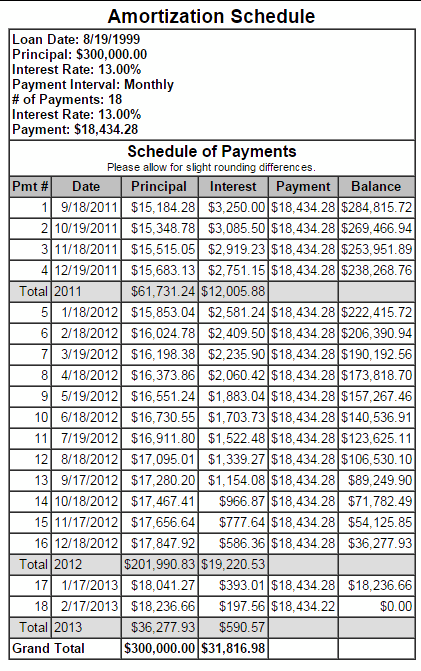 The amortization chart displays the days, interest payment, principal payment, extra payment, and balance. The mortgage rates of different lenders are displayed in both the closed term, and open terms. Calculator.net is a very beautiful and straightforward website which is used to generate amortization table, and amortization graph. You simply have to enter the details, like: loan amount, loan term, and interest rate. On clicking the calculate button, the results like monthly payment, total amount, and total interest is generated. 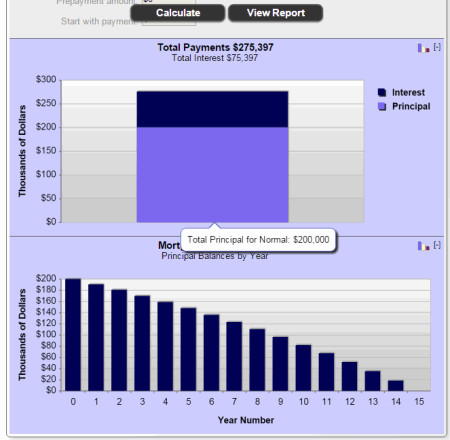 The payment, balance, and interest is shown in a graphical format, whereas the payment breakdown is displayed in a pie chart showing the principal, and interest. 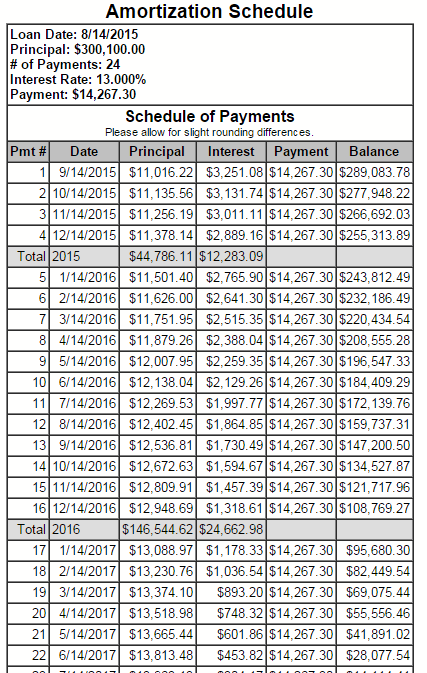 The amortization table displayed shows the beginning balance, interest, principal, and ending balance. The annual schedule, and the monthly schedule view can be chosen to view the required details. Free-Online-Calculator-Use.com has a loan amortization calculator where you have to enter the principal, or current pay-off amount, annual interest rate, payment remaining, and payment amount, out of which the field to be calculated is to be left blank. Then click on the calculate unknown loan variable, which generates the unknown variable, total years, total amount to be paid, and total interest to be paid. 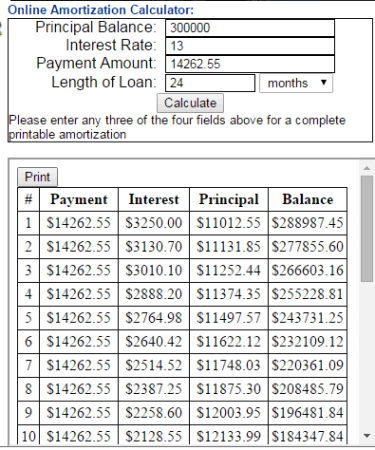 Click on the button printer friendly loan amortization schedule to generate the amortization table, which shows the payment, principal, interest, and balance. The printout of the generated report can be taken. TCalc TIMEVALUE lets you quickly generate the amortization table. You have to simply enter the loan details, like: price, down payment (a fixed amount, or percentage value), amortization duration, balloon payment after duration, and interest rate. On clicking the compute button, details are generated showing you the monthly payment amount, balloon payment amount, amount financed, total payment, and total interest. The result is generated using monthly interest compounding, and monthly payments. In case you choose the option to show the payment schedule, the payment schedule is generated which shows payment number, payment, interest, principal, and balance. In the end the final balloon payment, and the grand total of the deposits is displayed. 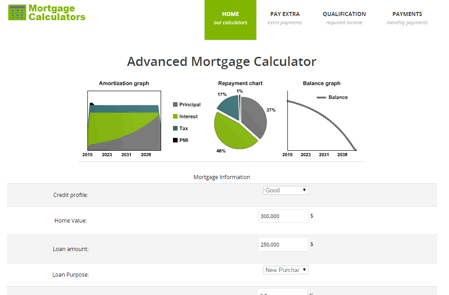 Easycalculation.com has a simple mortgage amortization chart generator tool. You have to enter your loan details, like: loan amount, interest rate, loan term, and loan payment start month. In case of early loan payment method adopted, add it to the loan prepayment amount, and select the loan prepayment frequency. 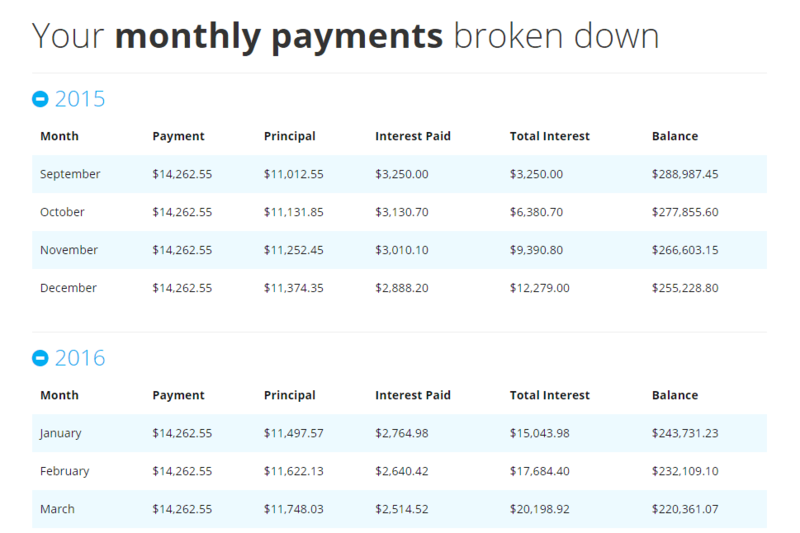 On clicking the calculate button, the monthly payment, and total interest without prepayment are calculated and the amortization table is generated displaying the year and month of payment, principal paid, interest paid, and loan balance. PROKERALA has a tool to generate loan amortization schedule. You have to just input your loan details, like: loan amount, loan tenure, interest rate, table view, starting month, and starting date. 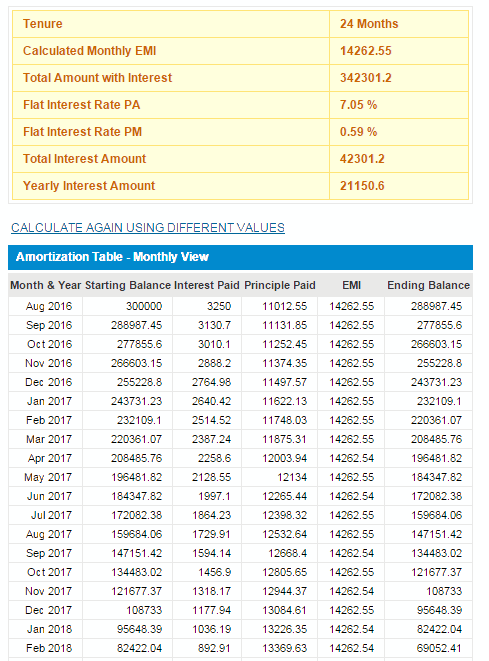 After clicking on the show amortization table button, amortization table is generated, which shows month and year, starting balance, interest paid, principal paid, EMI, ending balance, monthly EMI, total amount, flat interest rate per annum, flat interest rate per month, total interest amount, and yearly interest amount. 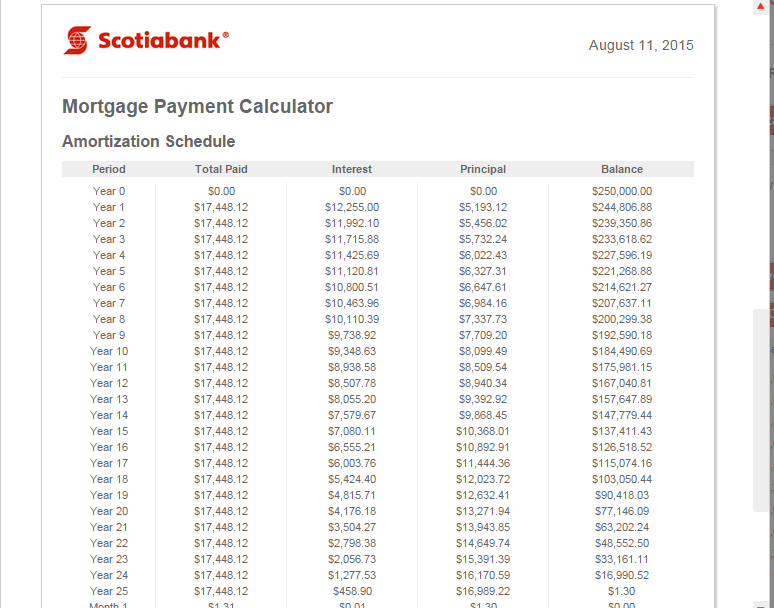 Scotiabank has a beautifully designed mortgage payment calculator. Using this website you can calculate the monthly payment amount, mortgage amount, and amortization table. 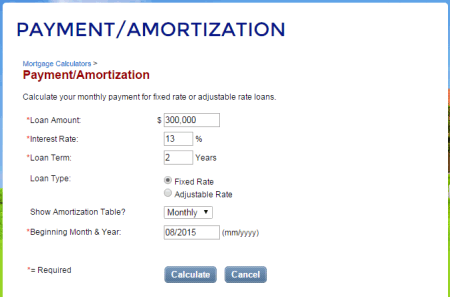 In order to create the amortization table, click on the amortization tab. Then you have to simply enter your loan details, like: mortgage amount, amortization value, payment frequency, interest rate, and product rate using sliders. The amortization is displayed in both the graphical form and chart form, which is easily accessible. 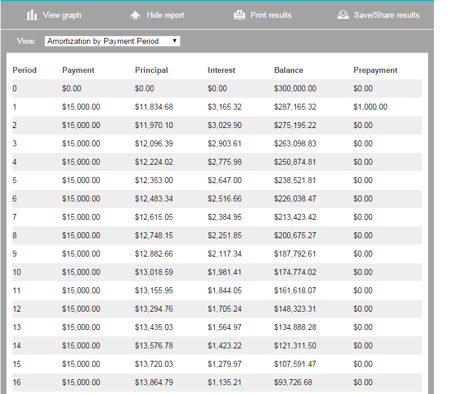 The details like total paid, interest paid, principal paid, and the remaining balance are displayed. On clickng the save more tab, you are suggested how you can save more money. If required, the additional lump sum payment option can be added and the chart is displayed accordingly. If required, the printout of the available results can be taken. Vertex42 grants you the option to create amortization tables online. In order to create the amortization schedule, you have to simply insert the loan amount, annual interest rate, loan term in years, first payment date, and the frequency of payment. Based on your choice of selections, the interest rate per period, payment per period, total payments, and total interest are displayed. The amortization schedule displays the due date, payment amount, interest, principal, and balance. The list displays only twelve instalments at a time. In order to view more, you have to enter the installment number in the top most serial number. Comparison of different payment frequency options is also displayed which shows the difference in payment amount, interest paid, and the total amount paid. 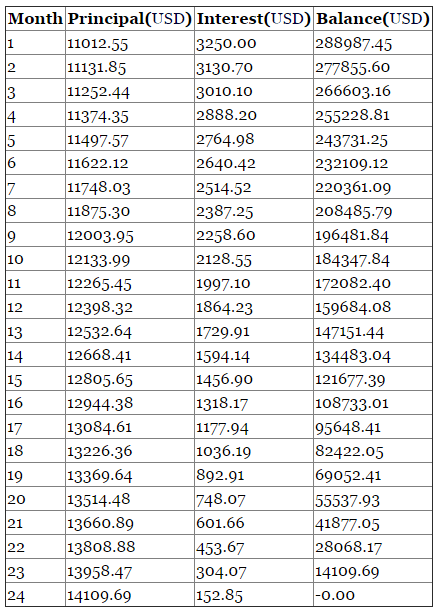 The printout of the generated amortization table can also be taken for any further use. 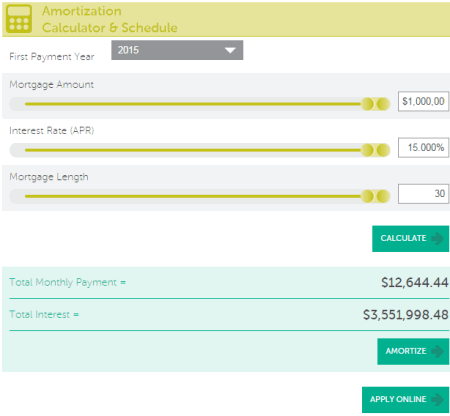 An easy to use amortization schedule calculator is featured on AMERICAN INTERBANC MORTGAGE. You have to enter the loan amount, interest rate, loan term, and beginning month and year. The loan type can be selected from either the fixed rate, or the adjustable rate. The option to show the amortization table can be selected showing yearly view or the monthly view. 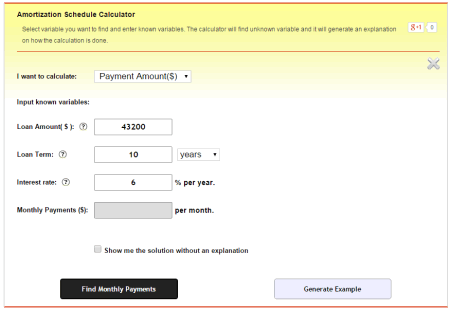 On clicking the calculate button, monthly payment, and amortization schedule are displayed. 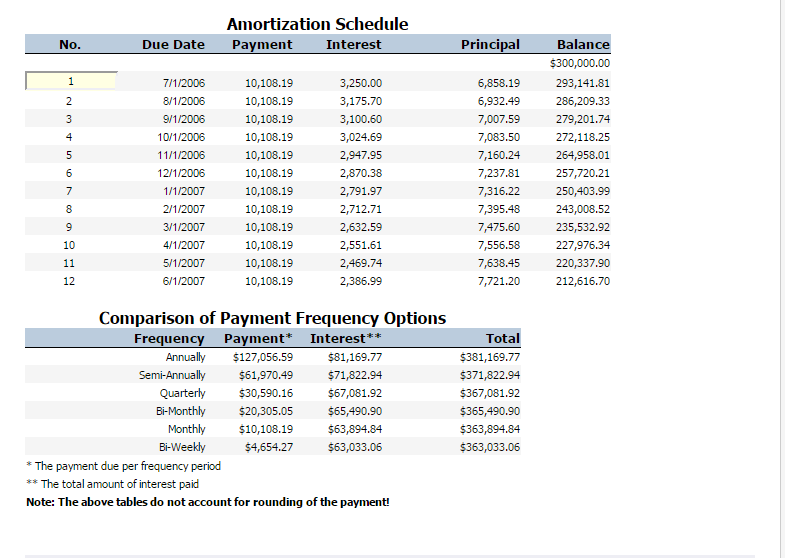 The amortization table shows the time period, regular payment, principal, interest, and balance. In the end, grand total, total payment, and total interest paid. 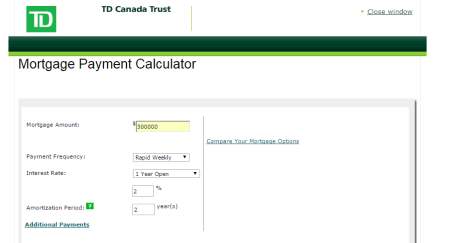 TD Canada Trust has a mortgage payment calculator, which can be used to generate amortization table. In order to do so you have to enter the mortgage amount, payment frequency, interest rate and amortization period. The calculated result displays the mortgage payment, insurance payment, total monthly payment, total principal and interest payment for term, total principal repayment for term, total interest cost for term, and balance at the end of the term. 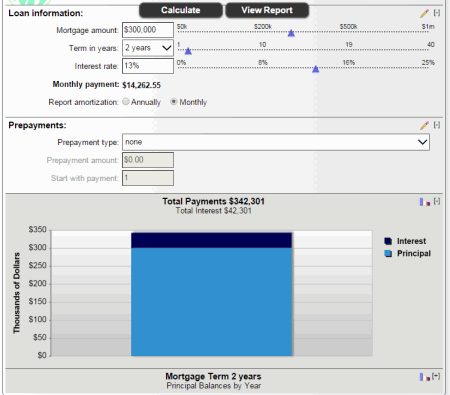 The mortgage amortization is displayed in a graphical interface. Click on the amortization schedule button to display the amortization table, which shows outstanding principal before payment, principal payment, interest payment, principal and interest payment, and outstanding principal after payment. The amortization schedule can be seen in monthly view, or the yearly view. The printout of the displayed result can be taken. CAPITAL BANK provides a simple, and easy to use tool to generate amortization tables. In the provided text-box input the loan details, like: amount of loan, annual interest rate, loan term in years, and the date of first payment. In order to generate the amortization schedule, be sure to check the check box titled amortization schedule, and click on the button calculate my monthly payment. This displays the month of payment, principal paid, interest paid, and the balance remaining. 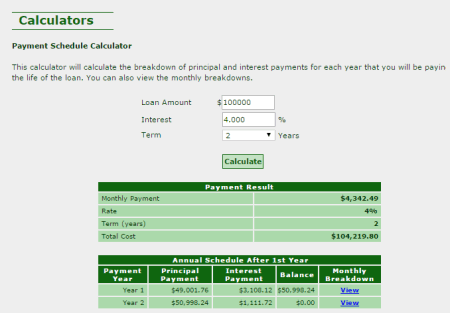 In the end the totals of the loan, interest, and amount is also displayed. The printout of the amortization table can also be taken out. BMO Bank of Montreal lets you generate amortization tables for free. Click on the tab mortgage payment calculator, and enter your loan details like amortization period, loan term, payment frequency, loan rate, and mortgage amount. The generated result displays the monthly payment, and interest cost for current term, at amortization, and at the end of term balance. Amortization details are displayed in the form of graph, and table. 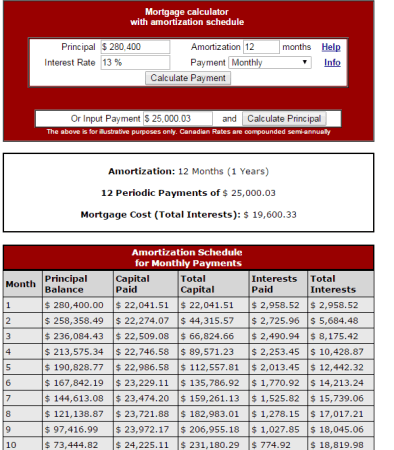 The amortization table displays the payment, principal, interest, and balance. 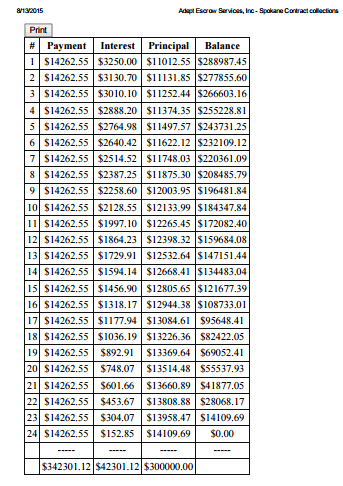 You can also take a printout of the displayed amortization table. You can also compare between a list of two loan types, so as to choose the best deals. LoansDirect features a very beautiful and easy to use amortization calculator. Input your loan details, like: principle, annual interest rate, balloon payment, number of payments per year, and number of regular payments. On clicking the calculate button, the payment amount, final balloon payment, interest only payment, total repaid, total interest paid, periodic interest rate, and total interest paid as percentage of principal are displayed. In case you want to view the amortization schedule, click the check box show amortization schedule. The amortization schedule displays the principal, interest, cumulative principal, cumulative interest, and principal balance. FEDERAL BANK enlists an amortization schedule calculator which is quite simple and easy to use. 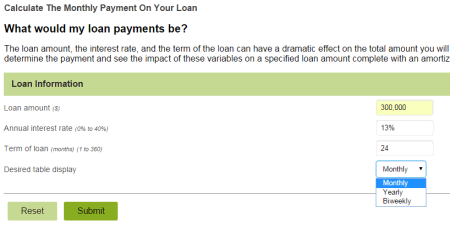 Just drag the slider to select the amount of the loan, annual interest rate, total period, and cushion period. Click on the calculate button, after which the payment details are generated containing the loan amount, balance amount after cushion period, period less cushion period, monthly payment, total interest, and total payment. 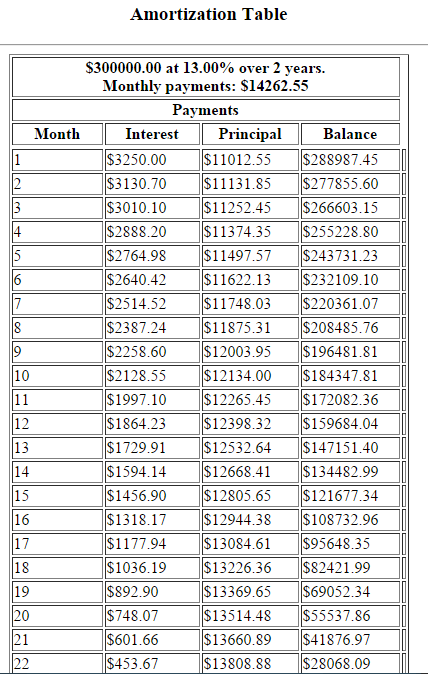 The amortization table displays the month, principal, interest, amount, and balance to be paid. JUNCTION NATIONAL BANK hosts an amortization schedule calculator. Enter your loan details like mortgage balance, interest rate, repayment period, beginning year, and beginning month. On clicking the calculate button, amortization table is generated, which contains due date, payment, interest paid, principal paid, and remaining balance. The amortization schedule can be downloaded as a text file, word document, or an excel spreadsheet. 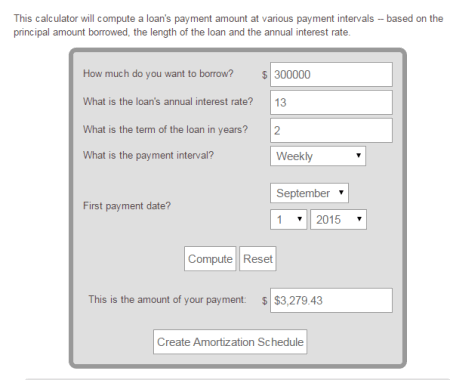 A very basic amortization calculator is featured on N Calculators. You have the option to select the currency, in which you want the amortization table to be calculated. 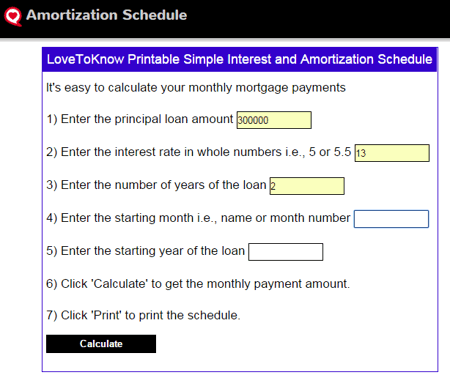 The amortization schedule calculator requires you to enter several loan details, like: loan amount, interest rate, and loan term. 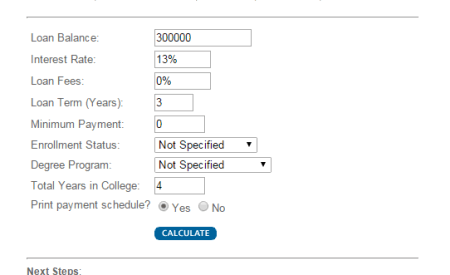 On clicking the calculate button, the result displays the monthly payment, total repayment, and total interest cost. 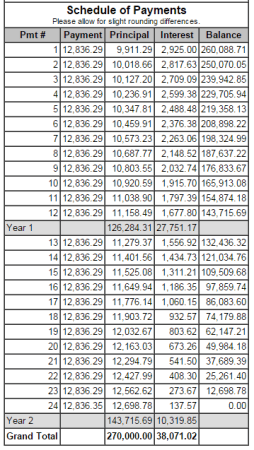 The generated amortization table displays principal, interest, and remaining balance. Loan Amortization Schedule for specifically students can be created with the help of FinAid. In order to benefit from this feature, and create your own personal amortization schedule for your loan, enter the loan details, like: loan balance, interest rate, loan fees, loan term, minimum payment, enrolment status, degree program, and total years in college. You also have the option to either output the amortization table, or not by checking the radio-box beside the print payment schedule. After you click on the calculate button the calculations display the average debt per year, monthly loan payment, cumulative payment, and total interest paid. The amortization schedule displays the payment number, payment, interest, principal, cumulative interest, cumulative principal, and the remaining balance. Credit Karma lets you generate amortization table, and calculate amortization calculations for free. 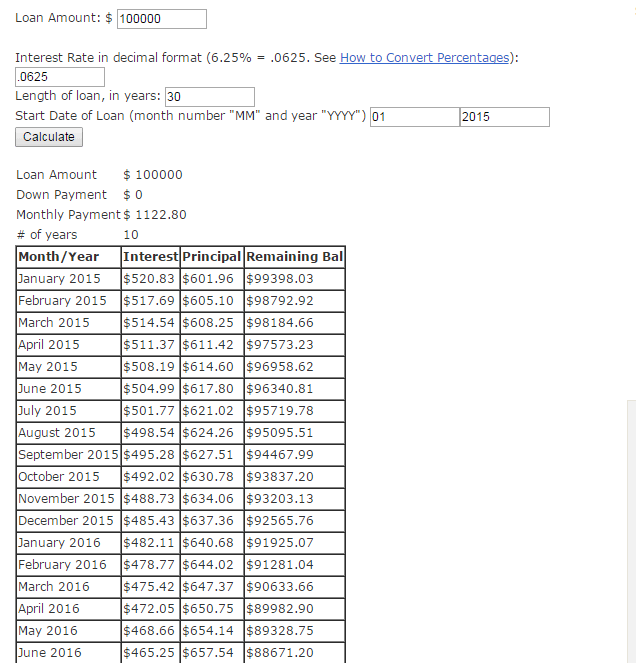 Enter the loan amount, interest rate, and number of years for the loan payment. On clicking the calculate button, amortization summary, amortization schedule, amortization chart, and principal payment charts are generated. The amortization summary displays the monthly payment, number of payments, total payment, and original loan amount is displayed. 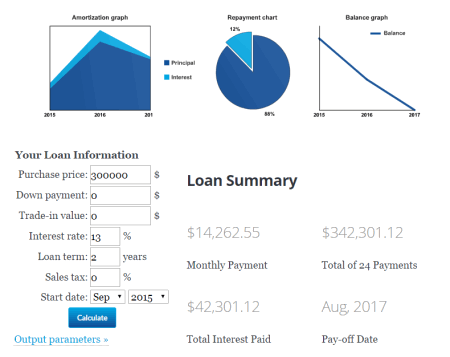 The loan amortization chart displays the principal, interest, and balance, and the principal payment chart display the principal paid, and the interest paid in graphical format. 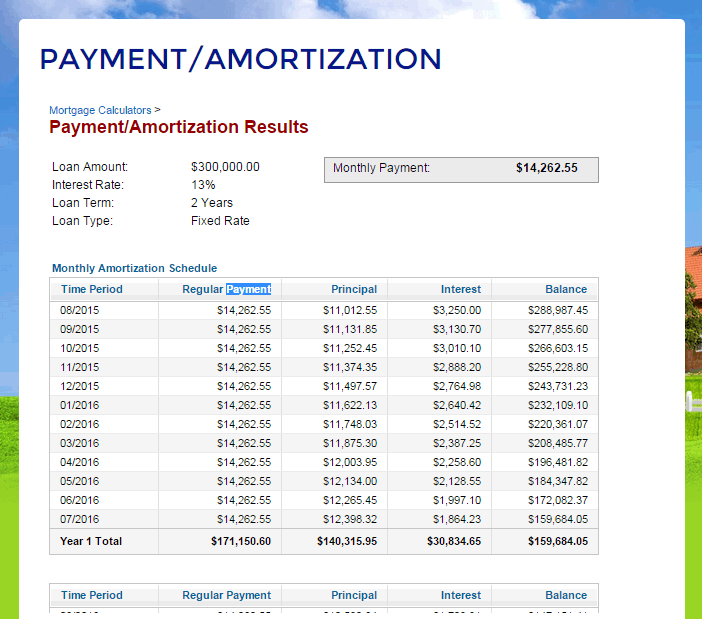 The amortization schedule display the payment amount, interest paid, principal paid, and the mortgage balance. 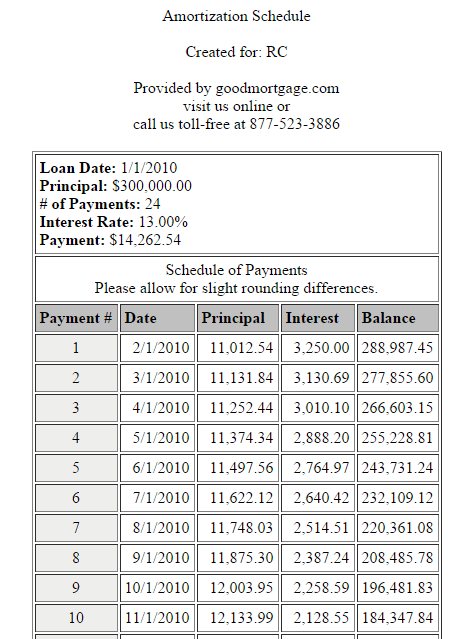 goodmortgage.com is a good website to create loan amortization table for free. Here you have to enter the customer name, original loan balance, interest rate, loan term, and loan start date. The compounding interval can be chosen from the drop-down menu from a list of options, like: monthly, quarterly, semi-annually, and annually. Then the amount of monthly payment is calculated. On clicking the button create amortization table, amortization table is generated, which displays: payment date, principal, interest, and balance. In the end the totals of the principal, and the interest are displayed. 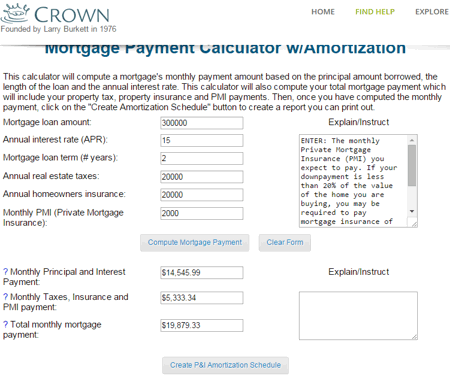 MortgageCalculator.biz has a quite friendly loan amortization calculator. All you have to do is input the data of your loans, like: home value, loan amount, interest rate, loan term, property taxes, home owner's insurance, private mortgage insurance, and closing costs. Based on the data entered, the monthly payment, monthly taxes, insurances, and PMI, total monthly payment, and down payment are generated. 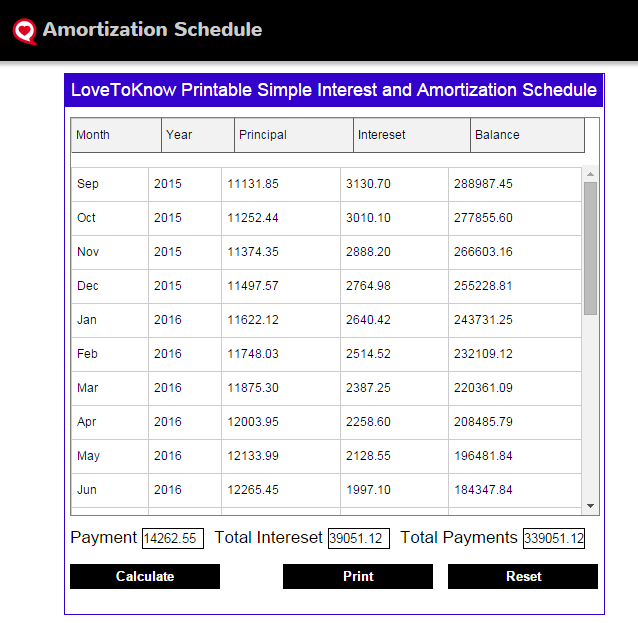 On clicking the create amortization schedule button, the amortization table is generated which display the date of payment, principal, interest, payment, and the remaining balance. At the end of each year the total of principal, and the interest are generated. 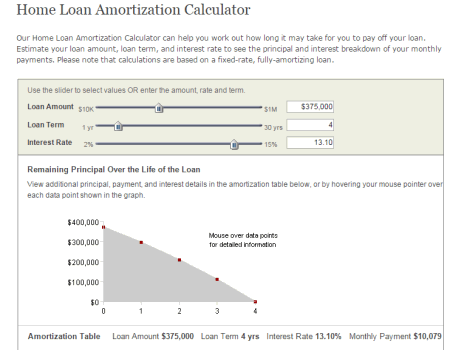 USAA has an easy to use amortization schedule calculator. Just enter the loan amount, interest rate, loan term period in years/months, loan term, and any additional payment. 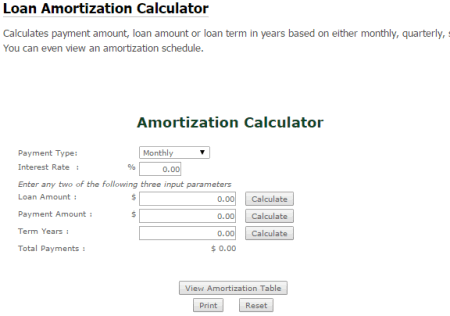 Click on the calculate button, after which the amortization table is generated. The monthly payment, and the benefit of payment of the additional payment is displayed in the amount of savings. The monthly payment amount of the principal, and the interest are displayed in graphical format. The pie chart of the payment breakdown of the loan displays the total principal, the total interest, and the total amount paid. 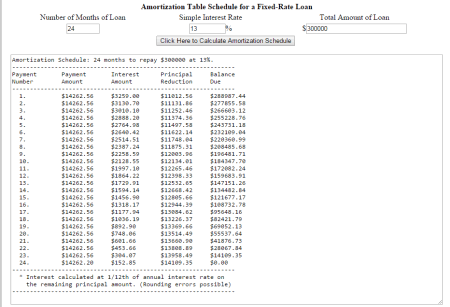 The amortization schedule display the principal paid, interest paid, and the remaining balance. Summit Ridge Credit Union is a website which along with other services also provides you the option to view and generate the amortization tables. Enter the mortgage details like loan amount, annual interest, mortgage loan term, annual real estate taxes, annual home owner insurance, and monthly private mortgage insurance. Then the mortgage payment is displayed, with: monthly amount, monthly taxes, insurance, PMI payment, and total monthly mortgage payment. 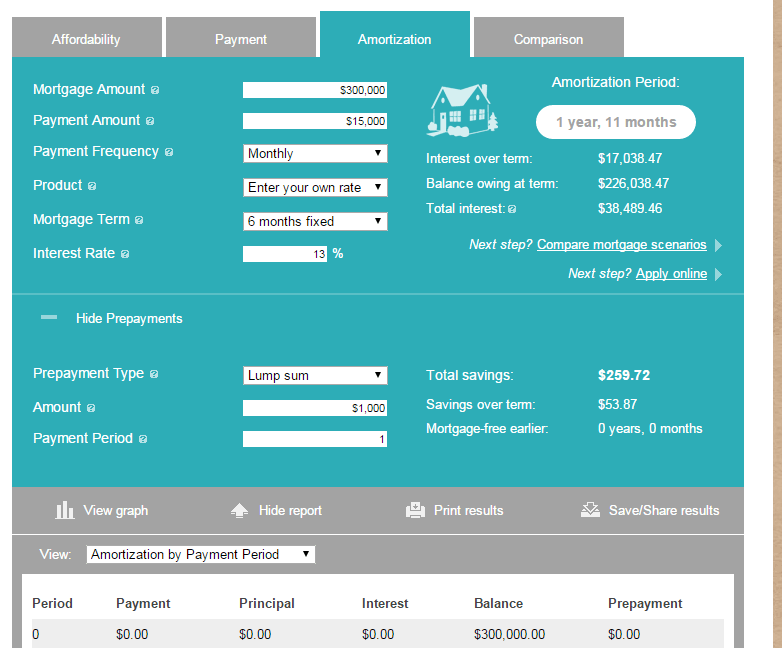 If desired amortization table can be generated with the click of a button, displaying: date of payment, principal, interest, payment, and remaining balance. 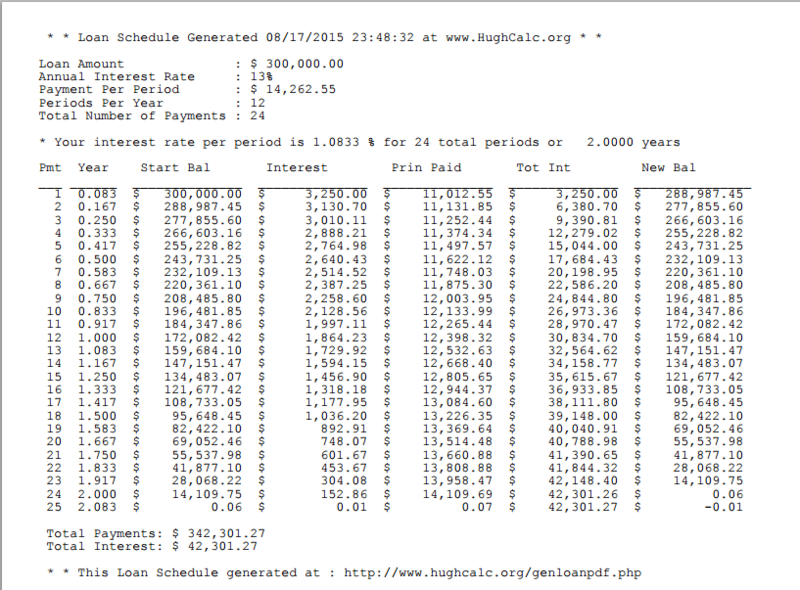 HughCalc.org features a loan calculator which unlike others, lets you take generate the amortization schedule in PDF format. You can also calculate the monthly payment amount, after entering the loan details, like: loan amount, interest rate, payment each period, periods per year, and loan duration. Click on the generate amortization schedule PDF, to generate a link below which can be clicked to download the PDF file. 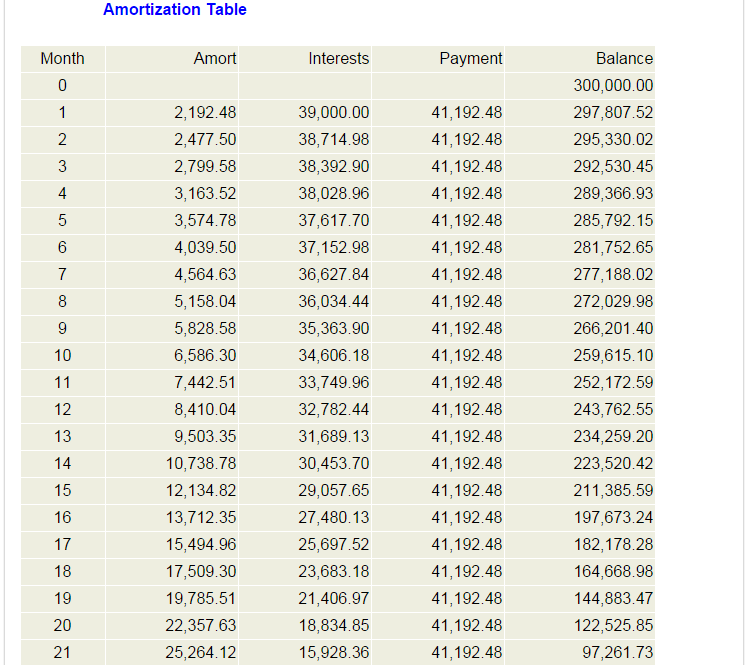 The amortization table generated displays the starting balance, interest, principal paid, total interest, and new remaining balance. In the end, the total payments, and total interest is also generated. Calculator.me has a very simple amortization calculator, with a sleek user interface. The data that is to be input here is mortgage loan amount, annual interest rate, mortgage loan term, annual real estate taxes, annual home owners insurance, and monthly PMI. 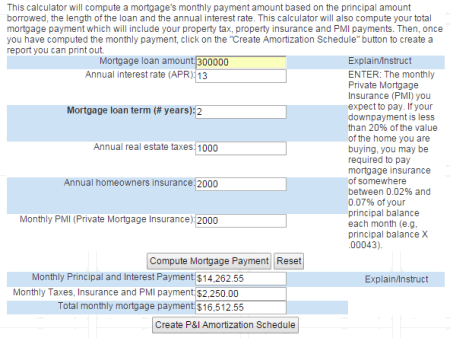 On clicking the compute mortgage payment, the monthly mortgage payment, monthly taxes, insurance, and PMI payment, and total monthly mortgage payment are generated. 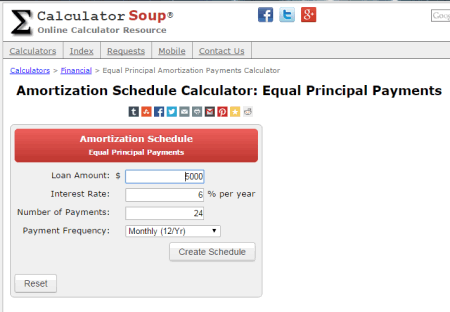 Click on the button create P&I amortization schedule to generate the amortization schedule. The amortization schedule generates the date of payment, principal, interest, payment, and balance. At the end of each year the total of interest, and payment are generated. Finally the grand total of the principal paid, and the interest paid are generated. PROBHARAT.COM is an Indian website displaying news of different aspects of life, along with it also features an amortization calculation tool. 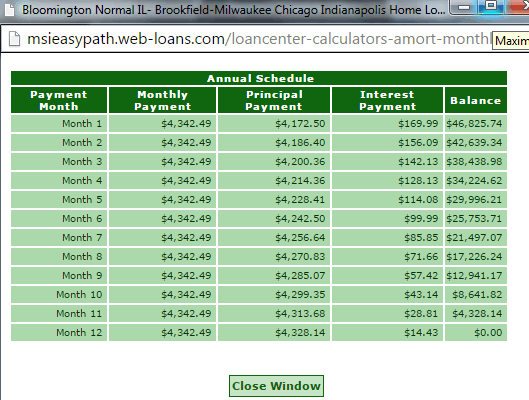 Enter the loan details, like: loan amount, loan tenure, interest rate, starting month, and year. 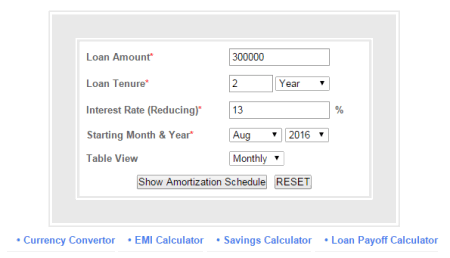 Click on the show amortization schedule button, detailed result of the loan is displayed. It generates the calculated monthly EMI, total amount with interest, flat interest rate per annum, flat interest rate per month, total interest amount, and yearly interest amount. 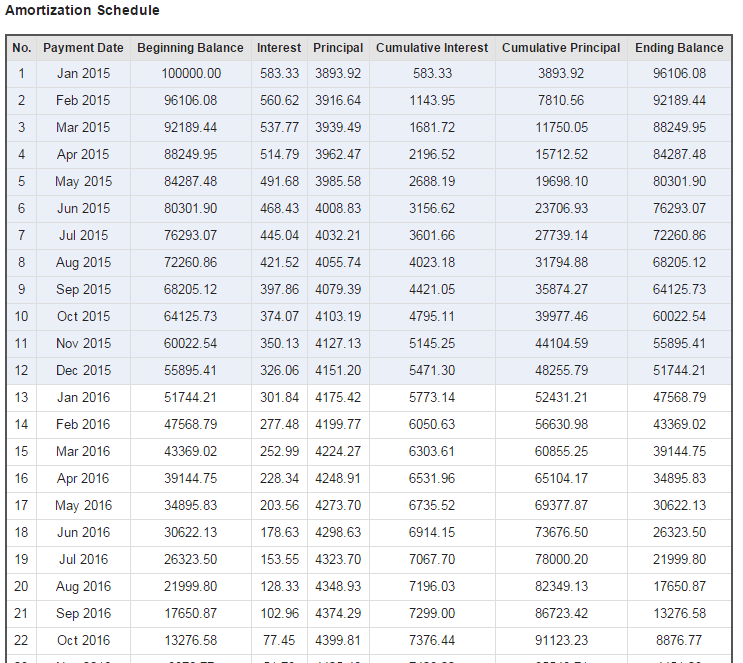 The amortization table displays the payment month and year, starting balance, interest paid, principle paid, EMI, and the ending balance. Dakota COMMUNITY BANK & TRUST is a banking organization, which on its website hosts a loan payment calculator with amortization schedule. Enter the loan amount that you want to borrow, loan annual interest rate, loan term, and payment date. From the payment interval, select the appropriate payment frequency, i.e. weekly, bi-weekly, semi-monthly, monthly, quarterly, semi-annually, and annually. On clicking the compute button, the payment amount is displayed. Click on the button, amortization schedule table is displayed showing the date of payment, principal, interest, payment, and balance. Great Plains Development Inc. is a website which provides professional leadership, and technical assistance in financing, loan pricing, and business planning. Loan amortization is among the various tools available here. 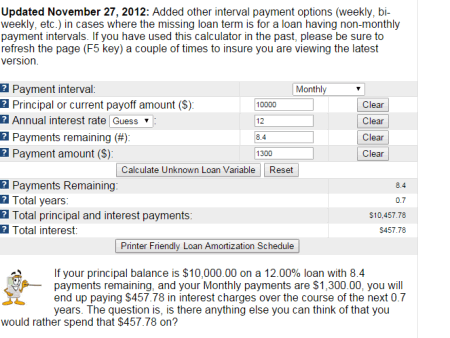 Enter the loan amount, annual interest rate, loan term in months, and loan start date. Click the compute button to display the amount of your monthly payment. Click on the create amortization schedule button, and the generated amortization schedule display the date of payment, principal, interest, and the remaining balance. In the end the total of principal, and interest is displayed. Arapahoe Credit Union is a federally insured working for credit unions. It provides certain tools to the customers to check, and manage their finances. One of them is the full loan calculator with amortization. Input your loan details, like: purchase price, down payment, amount, annual interest rate, loan term, and payment type. Click on the compute button to show the principal, interest rate, term, payment type, and payment details. On clicking the button create amortization schedule, the amortization schedule is generated, showing: payment, principal, interest, and balance. At the end of each year, the total of principal, and interest are displayed. Go Figure takes care of all the financial resources, like: family budget, mortgage, person and auto loans, retirement plans, investment, education, insurance, tax, estate, severance, and net worth. It has a number of calculators hosted on the website to take care of your financial problems, and help with financial assistance. Enter the mortgage amount, and interest rate. Select your payment frequency which can be either monthly, semi-monthly, bi-weekly, weekly, accelerated bi-weekly, and accelerated weekly. You can either input the amortization period, or the payment amount. 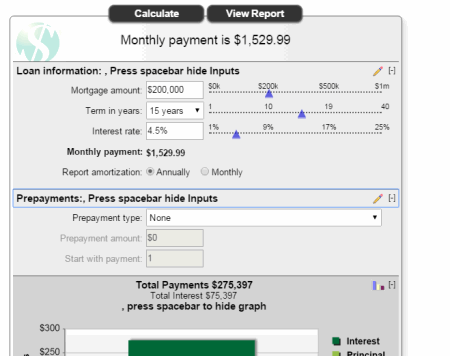 Then, on clicking the calculate button, total mortgage cost, and total interest costs are generated, and amortization table is displayed showing total payments, principal paid, interest paid, and ending mortgage balance. The printout of the generated amortization schedule can be taken for future reference. Mortgage-X is an information provider website, providing various mortgage information. Enter the loan amount, interest rate, term of loan, date of initial payment, and the option to whether see the complete amortization table, yearly amortization table, or no monthly table. 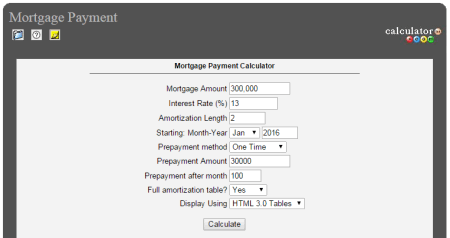 On clicking the calculate button, the amortization table is generated displaying the monthly mortgage payments, and total interest paid. 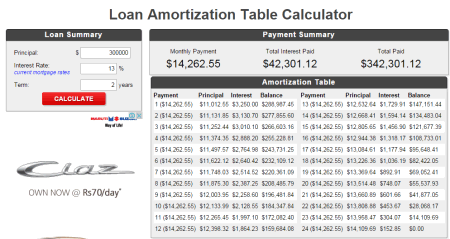 The amortization table displays the payment date, loan balance, interest, principal, and total interest. Based on your location, you are provided with better loan choices if required. BuildProsperityNow.com has a number of articles based on finances. 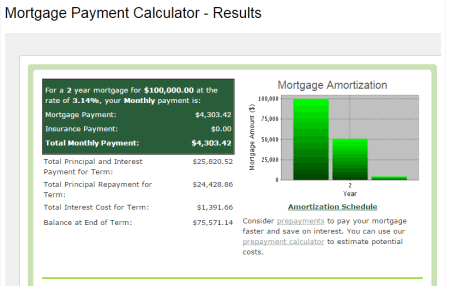 It also hosts a mortgage loan calculator to display the amortization schedule. Input your loan details like purchase price, mortgage term, interest rate, first payment date, and amortization table to be showed yearly, or monthly. The graph displays the interest, principal, and remaining balance. 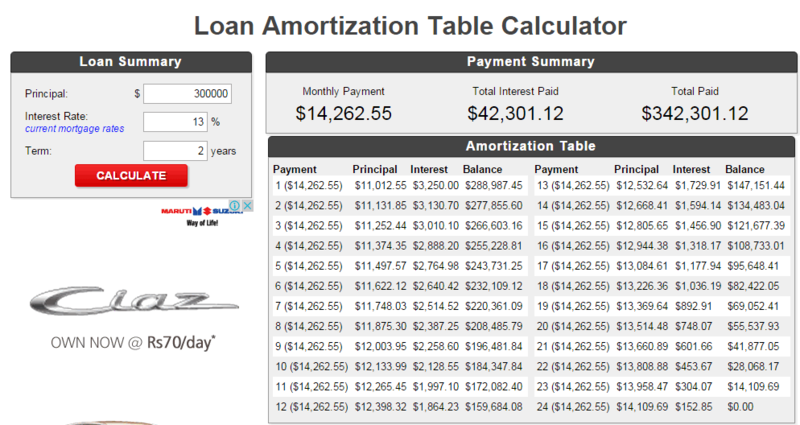 The amortization table displays the amortization date, principal paid, interest paid, and remaining balance. 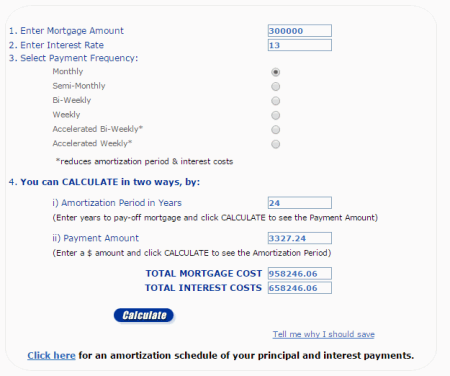 A very simple and clean website to view the amortization schedule table of your mortgage is Amortization-calc.com. 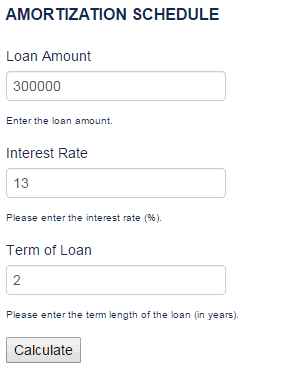 In this website you have to enter the loan amount, loan term, and interest rate. 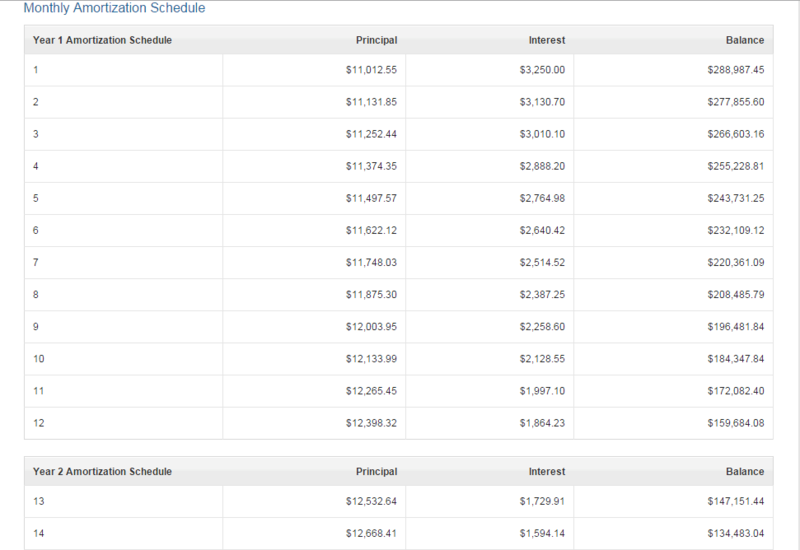 Then it displays the loan summary showing you the monthly payment, total payment, and pay-off date. In this page you also have the option to set the start date. 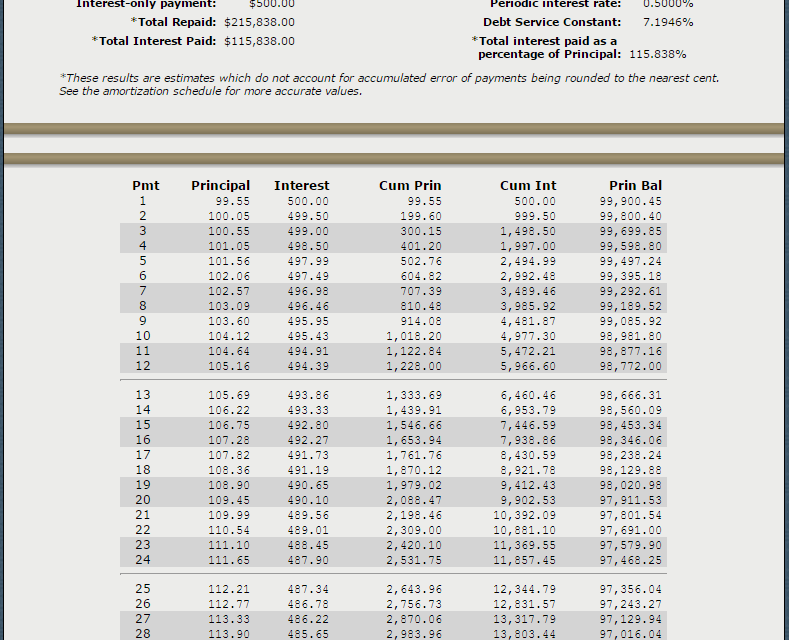 The interest, principal, and balance details are displayed in graphical period, and in tabular format. 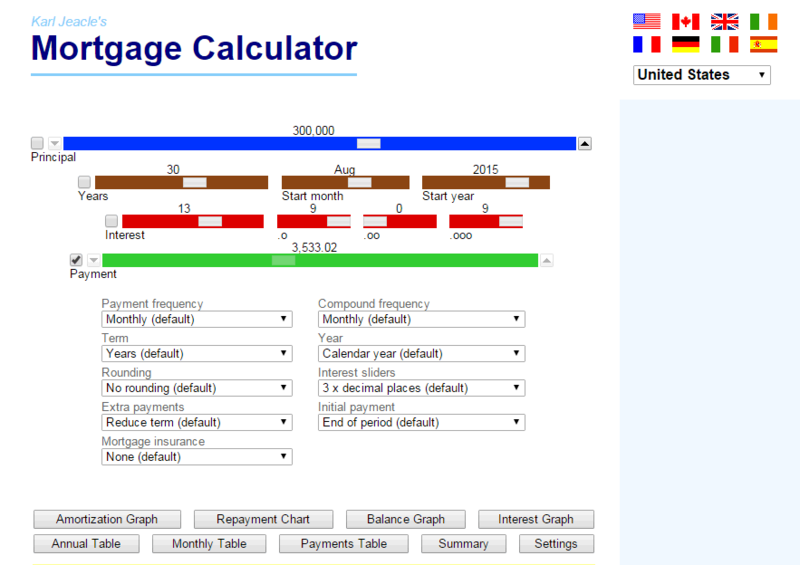 Mortgage Calculator is a very simple tool to calculate mortgage, which can be used to create amortization schedule. In this tool you have to simply enter the purchase price, down payment, amount to be financed, interest rate, loan term, and payment type. When you click on the calculate button the payment amount is generated. When clicked on create amortization schedule the amortization schedule is generated showing the payment, principal, interest, and balance. The total of the interest, and the principal are also shown. The common rates of interest by different loan providers is also offered. Bret Whissel is a simple website which provides you the option to generate the amortization schedule easily. You simply have to enter your loan details, like: principal, payments per year, annual interest rate, number of regular payment, balloon payment, payment amount. The details which you want to be calculated are to be left blank, or must have the value as zero. Click on the calculate button after clicking on the text-box to show amortization table. The calculated values show the principal, regular payment amount, final balloon payment, interest only payment, total repaid, total interest paid, annual payments, total payment, interest rate, periodic interest rate, debt service constant, and total interest paid as percentage of principal. Amortization table displays the elements like principal, interest, cumulative principal, cumulative interest, and principal balance. 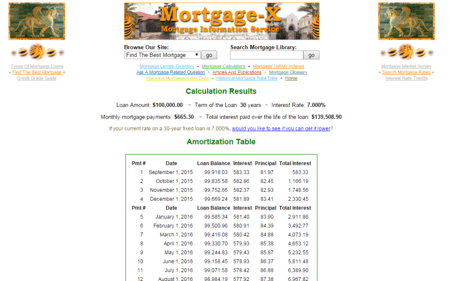 MYAMORTIZATIONCHART.COM features a very simple amortization schedule calculator, to create amortization table. In this tool, you have to enter the principal, interest rate, and loan term in months/years. Based on the basis of your selection to generate amortization table monthly/yearly, the amortization table is generated displaying amount, principal, interest, and balance. 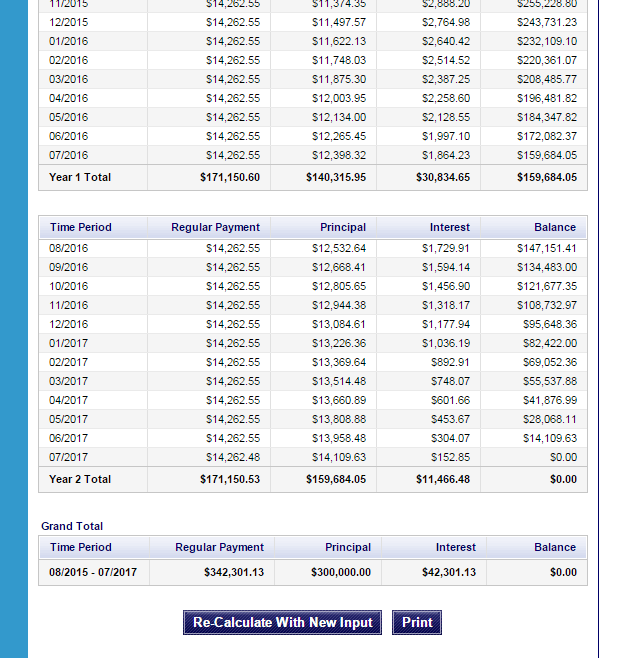 On the top of the page, the monthly payment, total principal paid, total interest paid, and total amount paid are calculated and displayed. The printout of the amortization table can also be taken. 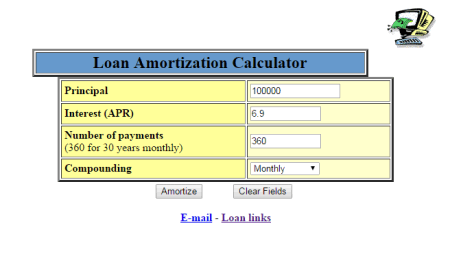 Yona has a plain loan amortization calculator. Enter the principal, annual rate of interest, number of payments (in months), and compounding period. The compounding period can be monthly, semi annually, quarterly, and annually. 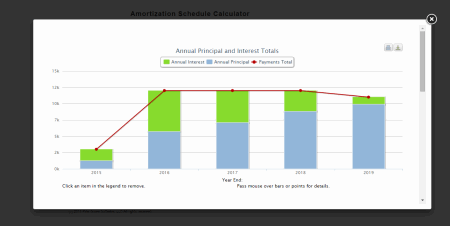 On clicking the amortize button, the amortization table is generated displaying the principal, interest, and balance. 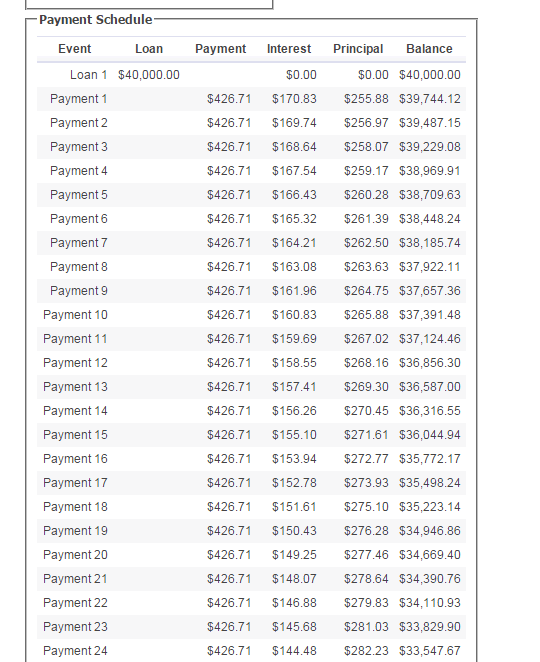 The loan overview shown above displays the total principal, payment, rate, total interest paid, and total loan value. 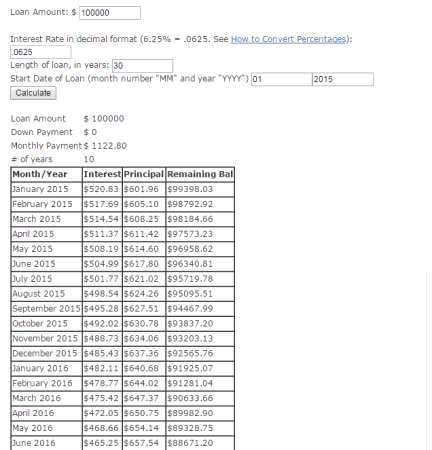 Deal4Loans has a tool which can be used to create loan amortization table. You have to simply enter the loan amount, tenure in months, interest rate, instalment number, and instalment date. 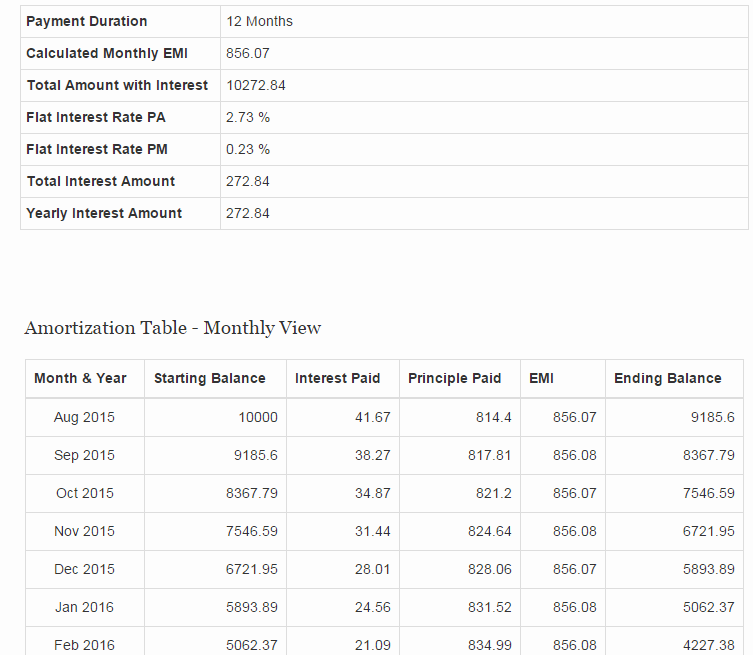 On clicking the calculate button, the amortization table is generated showing installment date, opening balance, EMI, loan outstanding, interest, and principal. 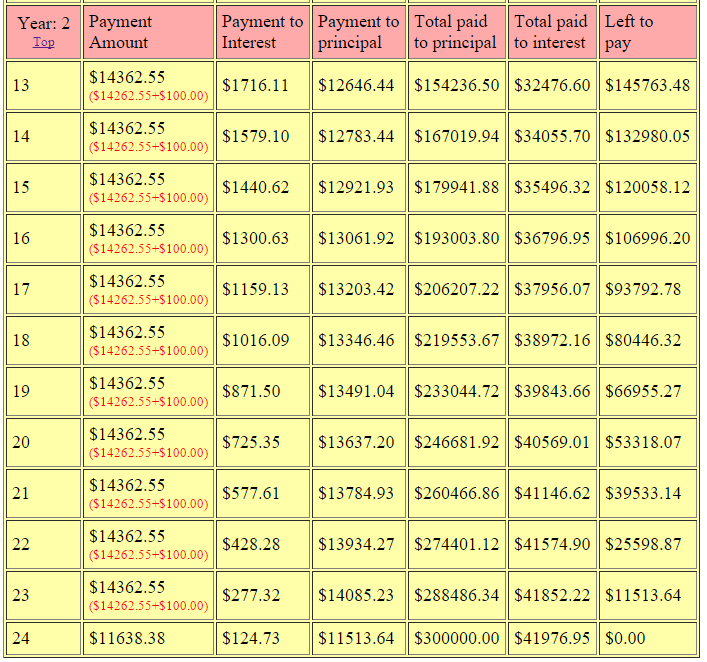 In the end, the total of the amount paid, interest paid, and principal are generated. WELLS FARGO has a simple home loan amortization calculator which can be used to generate amortization table. It has an easy to use simple interface where you have to simply use the slider to select the loan details, like: loan amount, loan term, and interest rate. Based on the input data, the principal versus loan duration chart is prepared, over which if mouse is hovered, it displays the details like principal paid, remaining principal, and cumulative interest paid. Amortization table displays monthly payments, principal paid, interest paid, remaining principal, and cumulative interest paid. 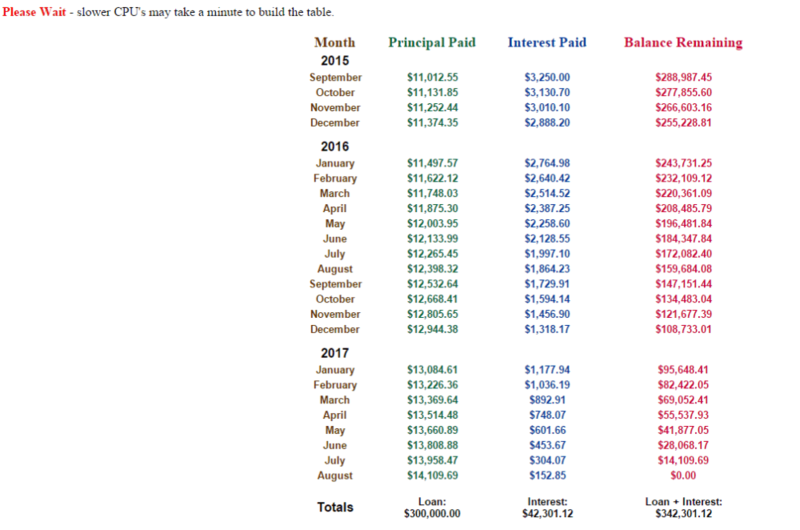 At the end of each table year the year total of monthly payments, principal paid, interest paid, remaining principal, and cumulative interest paid are displayed. 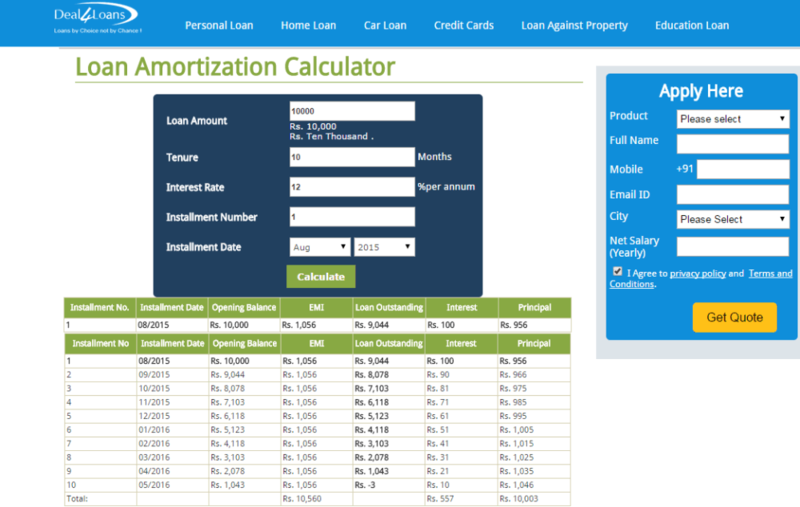 ApnaLoanGuru.com features a number of loan amortization schedule calculators, like: personal loan amortization schedule, home loan amortization schedule, mortgage loan amortization schedule, and car loan amortization schedule. When you select one of the loan amortization schedule, you have to provide the loan details, like: loan amount, number of EMI, and interest rate. On calculation different other details is also displayed like monthly interest rate, monthly EMI payment, total loan amount payable, and total interest payable. 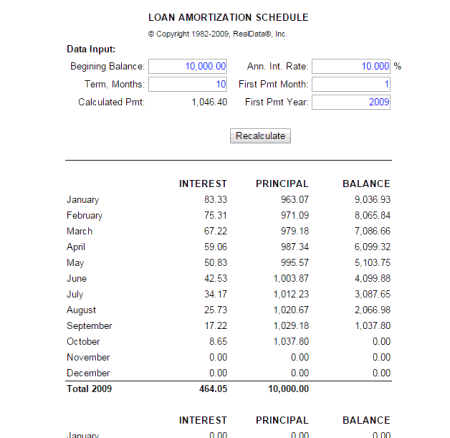 The amortization table is also displayed showing the loan period, EMI, interest, principal, and balance. About.com is a very popular website which also features a loan amortization calculator. Here you have to simply enter the details of your loan, like: loan amount, interest rate, length of loan, and start date of loan. After you click on the calculate button, the monthly payment is calculated, and amortization table is generated, which shows the interest, principal, and remaining balance. 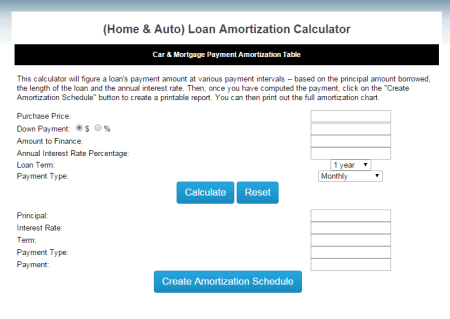 AmortizationTable.org hosts a simple loan amortization table calculator which is quite simple, and easy to use. All you need to do is enter the principal, interest rate, and loan term. 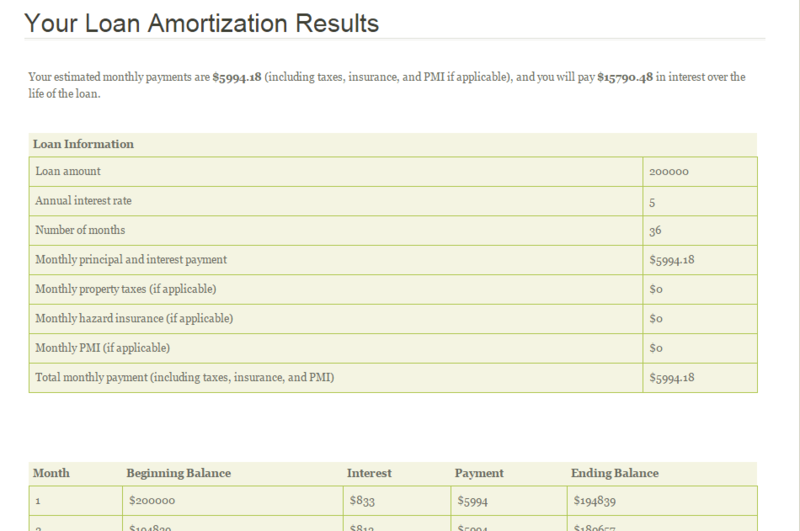 On clicking the calculate button the payment summary, and amortization table is generated. The payment summary displays the monthly payment, total interest paid, and total amount paid. 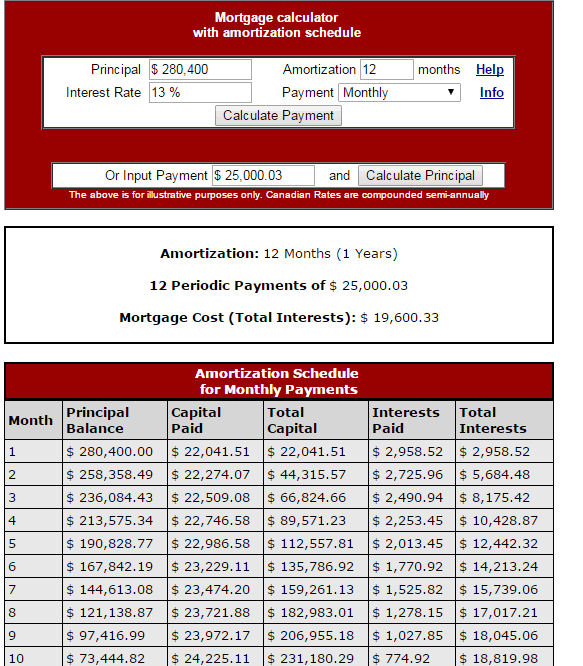 The amortization table displays the payment, principal, interest, and balance. 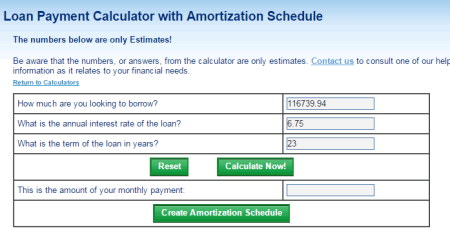 calculators.org has an aesthetic amortization schedule calculator, where you can easily create the loan amortization table. All you have to do is enter the loan amount, loan interest rate, loan term, payment interval, and first payment date. After you click the calculate button, the monthly instalment amount details are displayed. On clicking the create amortization schedule button, amortization schedule is generated which shows the principal, interest, payment, and balance. 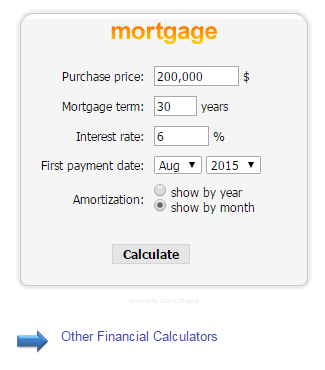 RBC Royal Bank has a mortgage pay-off calculator tool to view the amortization chart. 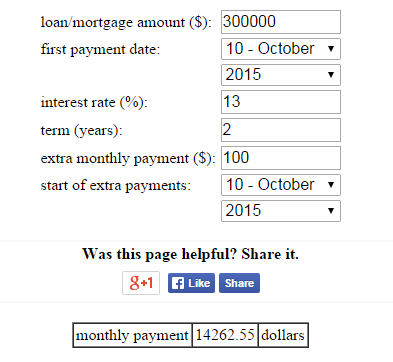 Just enter the mortgage amount, rate, payment frequency, payment amount, and start date. Click on the option to show the full amortization table, or the yearly amortization table. 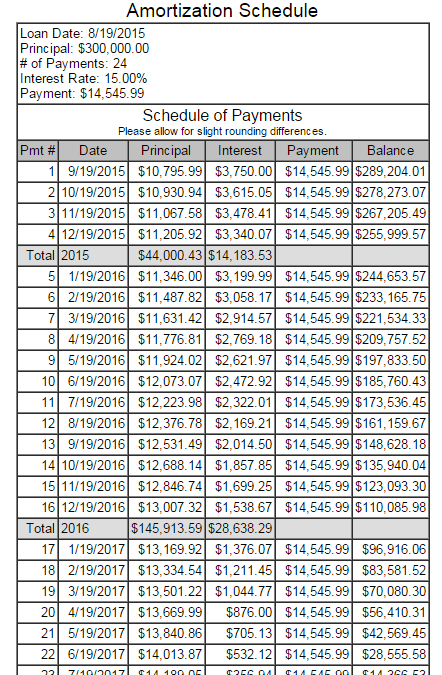 The amortization table displays the outstanding principal, amount paid, interest payment, principal payment, and new outstanding principal. In the end the total amount paid, and total interest paid are displayed. 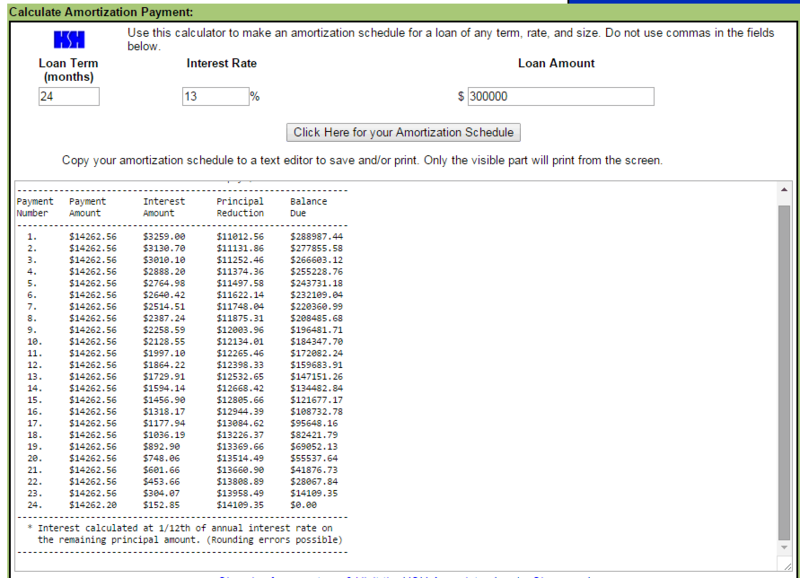 miniwebtool hosts a simple amortization schedule generator, which is quite easy to use. Enter your loan details like loan amount, annual interest rate, loan term, starting month, and starting year. 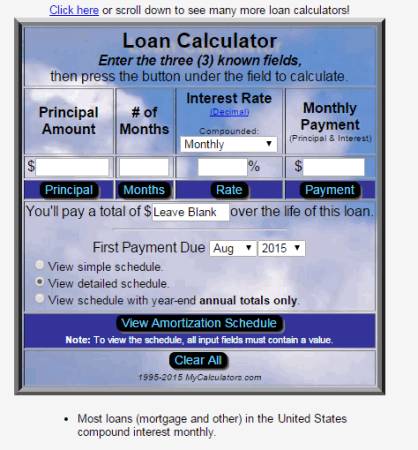 Click on the calculate amortization schedule button to generate the amortization schedule, after which the loan summary shows the monthly loan payments, annual loan payments, total interest paid, total amount, and final pay-off date. The amortization schedule display the payment date, beginning balance, interest, principal, cumulative interest, cumulative principal, and ending balance. Calculator Soup has a straightforward amortization schedule calculator where you have to just enter your loan details, like: loan amount, interest rate, number of payments, and payment frequency. Click the create schedule button to generate the amortization schedule, which shows the payment amount, principal part, interest part, and balance owed. Some other details are also displayed like constant principal payment, total payments, and total interest charged. 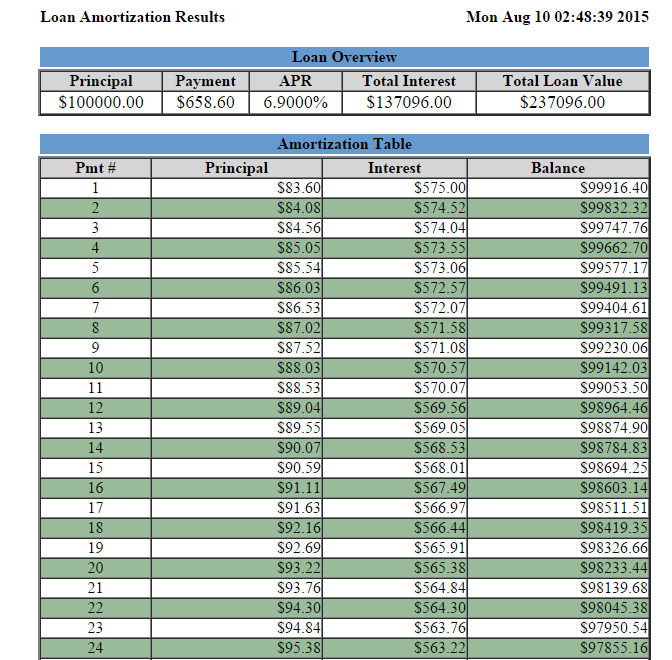 You are also provided the option to take a printout of the amortization table. 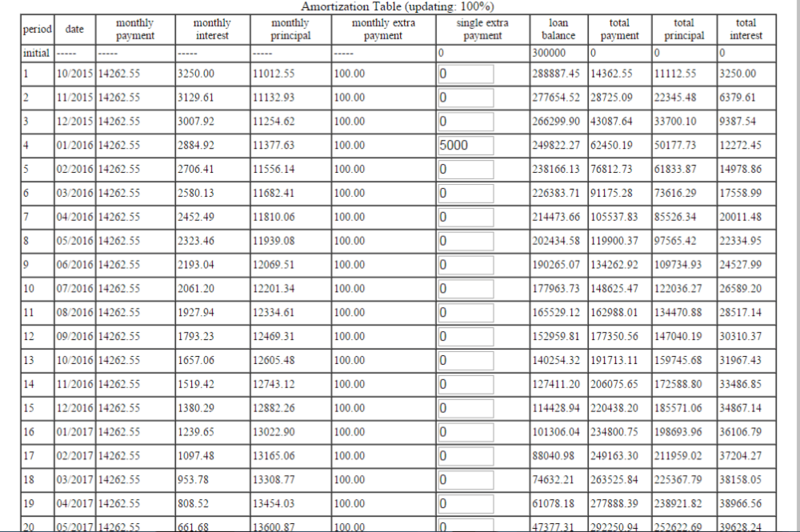 gyplan.com presents you amortization table generator utility, which is quite easy to use. It makes use of the French Amortization System, i.e. : equal payments, growth of principal of amortization value, and decreasing interest value. You have to enter the principal, period in months, and monthly interest rates. On pressing the calculate button, the calculations are displayed showing you the monthly payment, total interest, and total payment. 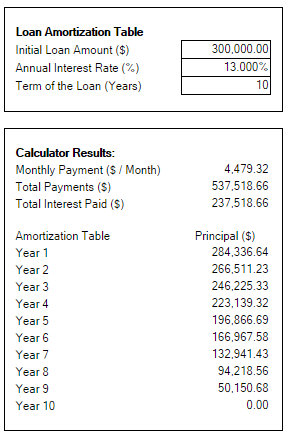 The amortization table displays the principal paid, interest paid, total amount paid, and balance. RIVER BANK & TRUST has a loan payment calculator which can also be used to create amortization schedule. Just enter the details like loan amount, interest rate, loan term, payment interval, and date of first payment. On clicking the compute button, the amount to be paid for the loan is displayed. 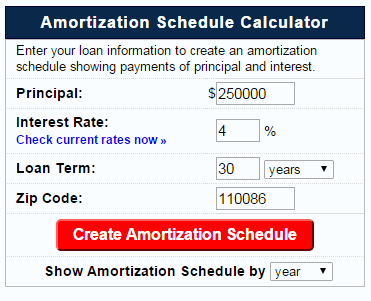 In order to generate the amortization schedule, you have to click on the button create amortization schedule. The generated amortization schedule displays the date of payment, principal, interest, payment, and the remaining balance. 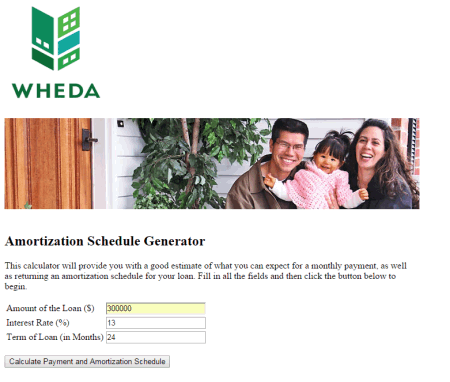 A very simple, and easy to use amortization schedule generator app is available on WHEDA. In order to use it, just enter your loan details, like: loan amount, interest rate, and loan term. 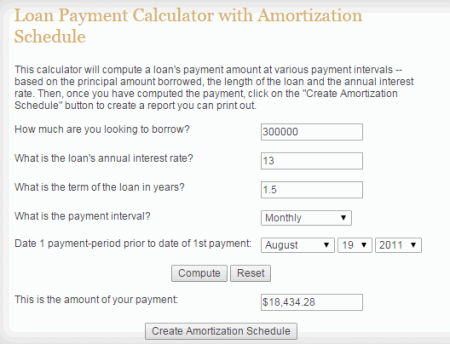 On clicking the calculate payment and amortization schedule button, the amortization of monthly payment is displayed. 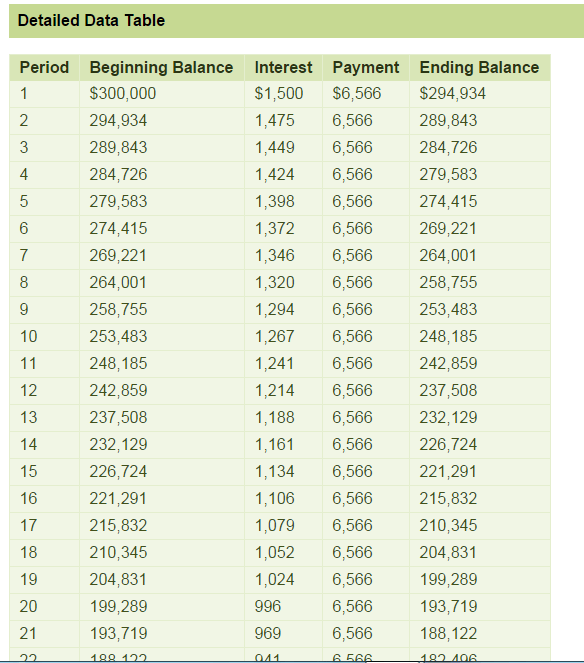 The amortization table displays the interest, principal, and balance. Vanderbilt is a mortgage and finance website, which also lets you create amortization table for free. In order to generate the amortization table, you simply have to enter the mortgage details, like: loan amount, interest rate, and loan term. 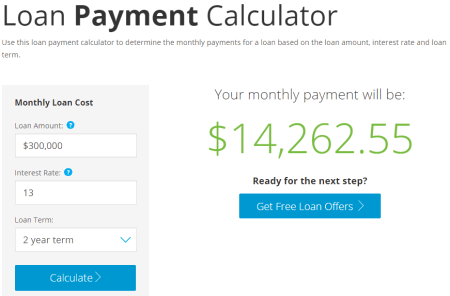 On clicking the calculate now button, the amount of the monthly payment is generated. After you click on the create amortization schedule button, amortization table is generated, which contains payment date, principal, interest, total payment, and the remaining balance. A very simple app to generate the amortization schedule is available on Ruth Technology website. 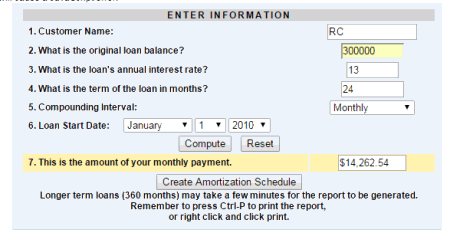 Just enter the loan term, interest rate, total amount, and click on the button to generate the amortization table. 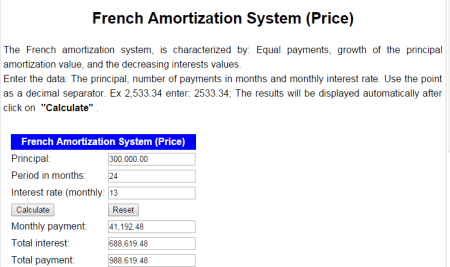 The generated amortization table display the payment amount, interest amount, principal reduction, and the balance due. 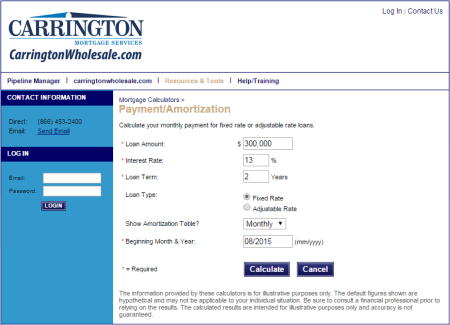 A simple online amortization tool calculator is featured on Waterstone MORTGAGE. Simply drag the sliders, or enter the loan details in the boxes provided, of the mortgage amount, interest rate, and mortgage length. On clicking the calculate button total monthly payment, and total interest is calculated. 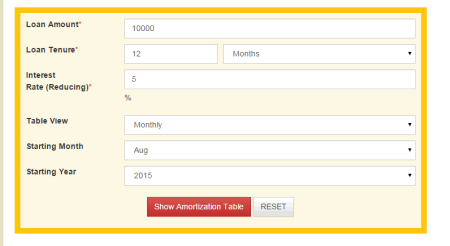 On clicking the amortize button, amortization table is displayed in yearly view. 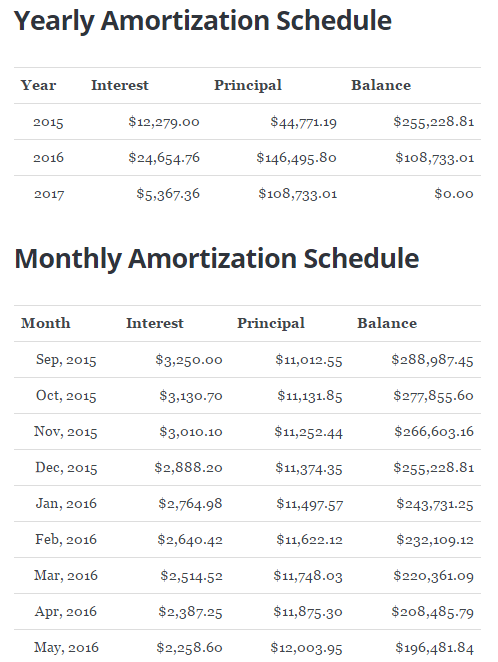 The amortization table displays the year, interest, principal, and balance. 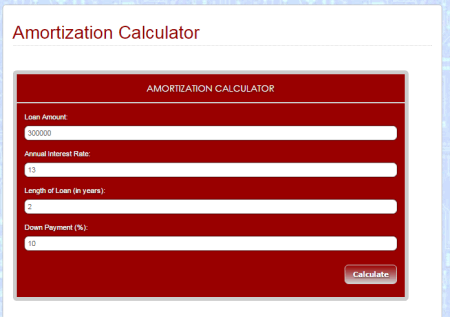 A simple and easy to use amortization calculator is available on FUNCRON Realtors. Just enter the amount to be financed under the sale price, down payment in percentage, length of mortgage, and annual interest rate. 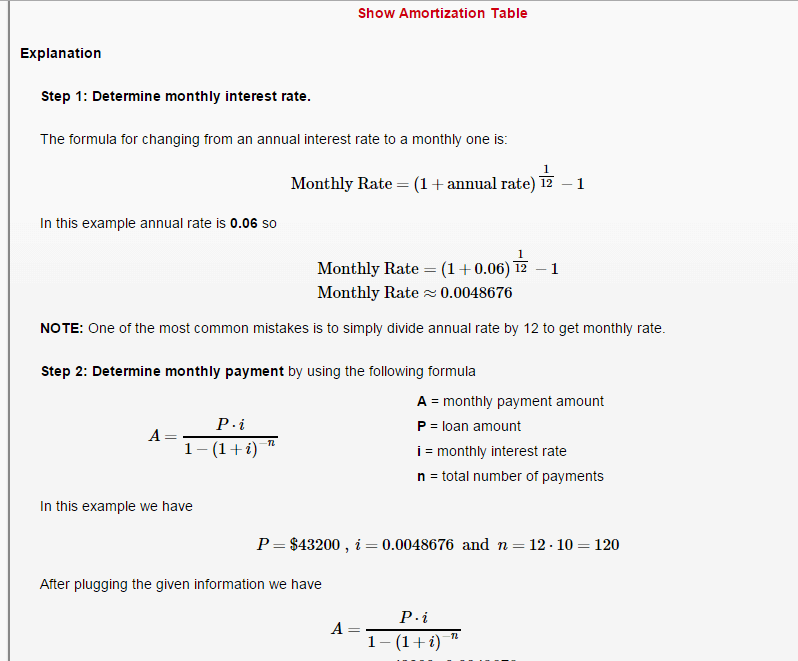 Check the check-box to show the calculations and amortization table. 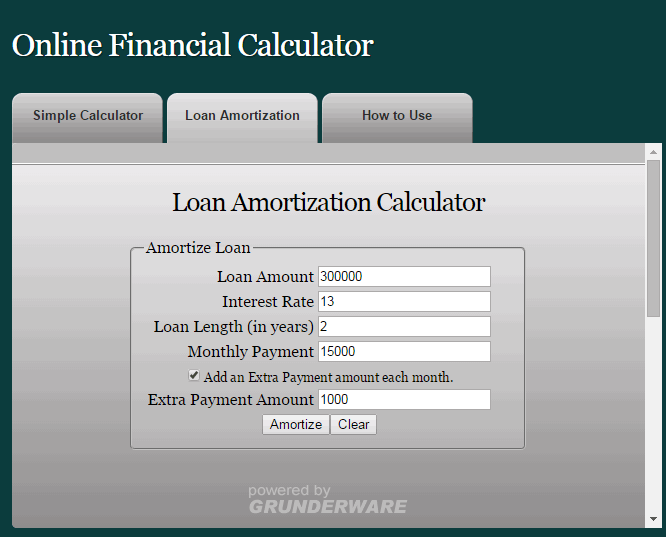 On clicking the calculate button, the detailed calculations of the amortization process are displayed. Amortization chart displays the interest paid, principal paid, and the remaining balance. 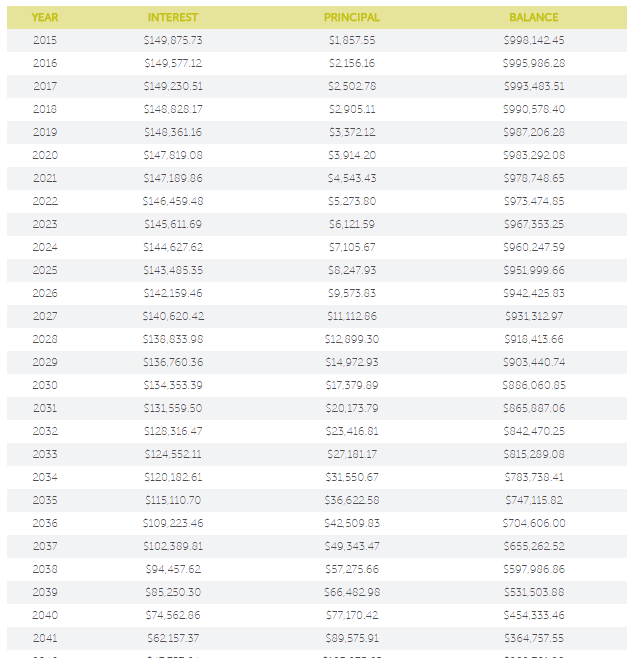 The totals for each year is displayed in the end showing the amount spent in that year, amount paid for interest, and the amount paid on principal. Butler Consultants can be used to generate amortization schedule for the loans to provide a rough idea of the monthly loan payment. Just enter the loan amount, loan interest rate, and loan term in months. 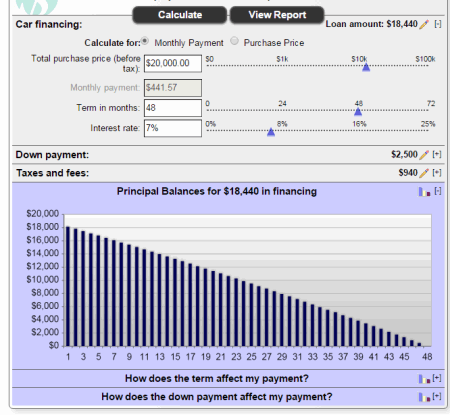 On clicking the calculate button, the monthly payment is displayed, and the amortization chart is generated. The amortization chart displays the balance, principal, interest, total payment, and total interest. Adept Escrow Services is a real estate service provider, and also hosts an online amortization generator tool. Just insert the details of your mortgage, like: principal balance, interest rate, payment amount, and length of the loan. On clicking the calculate button, the payment amount, interest paid, principal paid, and balance paid are displayed. The printout of the amortization schedule can be taken out as well. Eagle Federal CREDIT UNION, along with other facilities, offers you a tool to generate amortization schedule. Enter the loan details like loan amount, interest rate, and the term of loan. After clicking on the calculate button the amortization table is generated showing you the principal paid, interest paid, and the balance paid. The monthly payment is also generated that is to be paid. 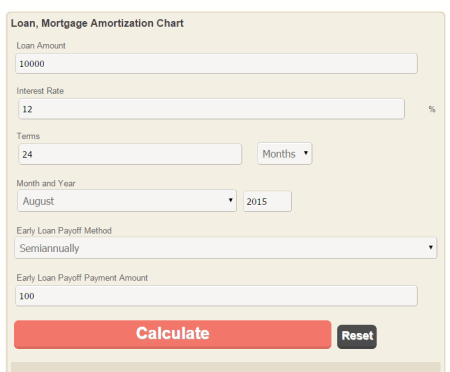 Amortization schedule calculator is available on NRL Mortgage website. 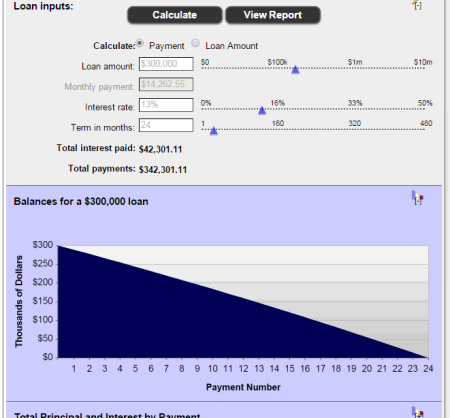 Enter the loan amount, interest rate, and loan term. The loan type can be selected as either the fixed rate, or the adjustable rate. The option to show the amortization table in the monthly, or yearly format can be selected. 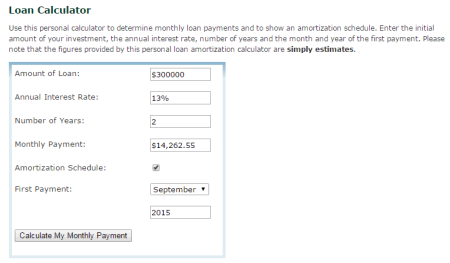 In case you select the option not to view the amortization table, the calculated monthly payment is displayed. The monthly payment displays the regular payment, principal, interest, and the balance. 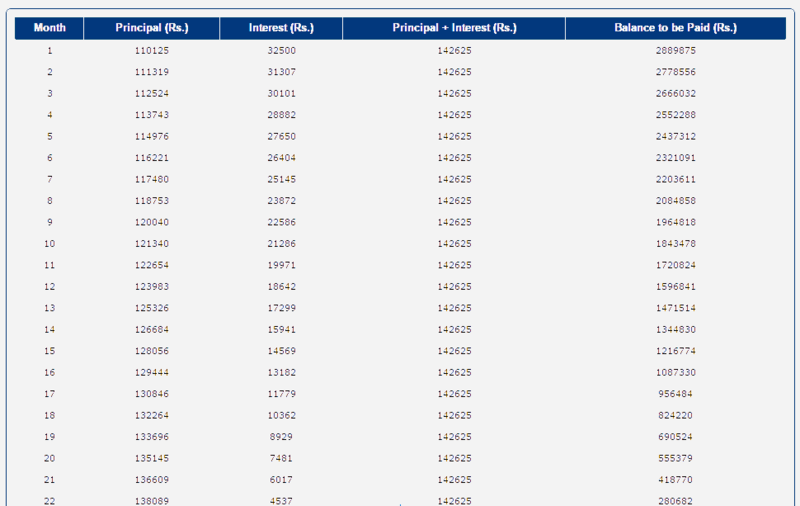 In the end of the year, the total of regular payment, principal, interest, and the remaining balance are displayed. The printout of the generated amortization table can also be taken. 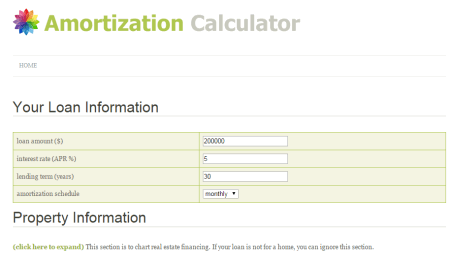 WEBWINDER has an amortization schedule calculator which can be used to view the loan payment distributions. Add the loan amount, annual interest rate, loan term, annual taxes, annual insurance, and monthly PMI (Private Mortgage Insurance). Based on the data entered, the mortgage payment is calculated displaying the monthly principal, and interest payment, monthly taxes, insurance, and PMI payment, and total monthly mortgage payment. When you click on the button, create P&I amortization schedule, amortization schedule is created, which displays: date of payment, principal, interest, payment, and balance. Capital Title is a insurance company provider, which also features a loan amortization calculator, which is quite easy to use. 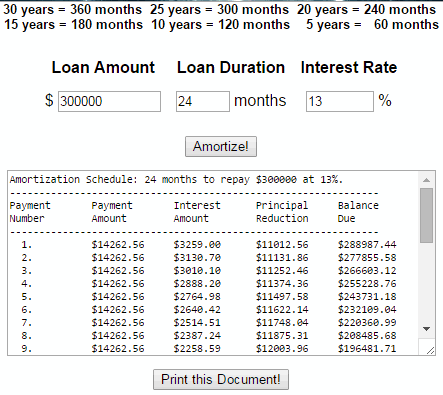 Just enter the loan amount, loan duration, and the rate of interest. On clicking the amortize! 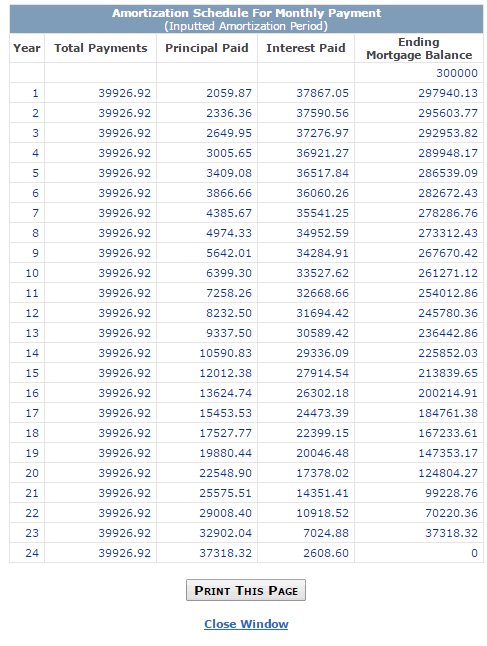 button, the amortization table is generated. The amortization schedule generated displays the payment number, payment amount, interest amount, principal reduction, and the balance due. If needed, the printout of the generated result can also be taken. AgStar provides financial services, and business tools to its customers. One such service provided by the organization is a loan amortization calculator, which is free to be used by anyone. Input any two of the three input parameters: loan amount, payment amount, and term years. Enter the interest rate, and payment type, i.e. monthly, quarterly, semi-annual, and annual. On clicking the calculate button, the unknown variable, and the total paid amount are displayed. On clicking the view amortization table button, the interest payment, principal payment, and the remaining balance are displayed. 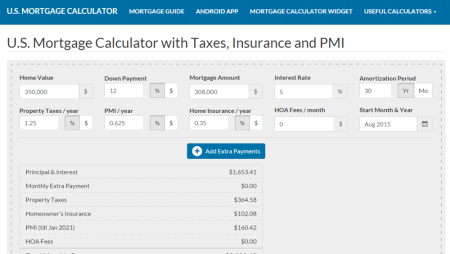 calculator.com has numerous calculators hosted on its website, and one among them is the mortgage payment calculator. Input the mortgage amount, interest rate, amortization rate, starting month-year, prepayment method, prepayment amount, and prepayment after month. The prepayment method may be one time, monthly, annually, and bi-weekly. The options may be chosen to display the full amortization table, or the partial amortization table, and to display the amortization table as HTML 3.0 table, or as plain text. 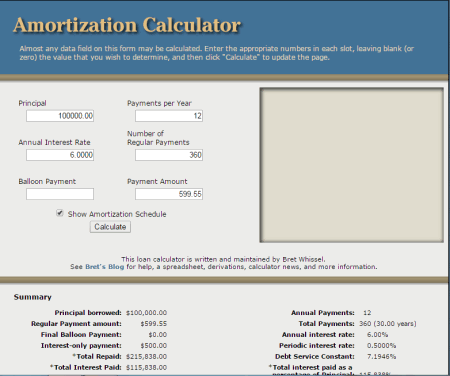 On clicking the calculate button, the amortization schedule is displayed, showing: monthly payment, principal, payment contributed towards principal, interest paid, and the remaining balance. At the end of each year of payment, the totals of the each of the entities are displayed. 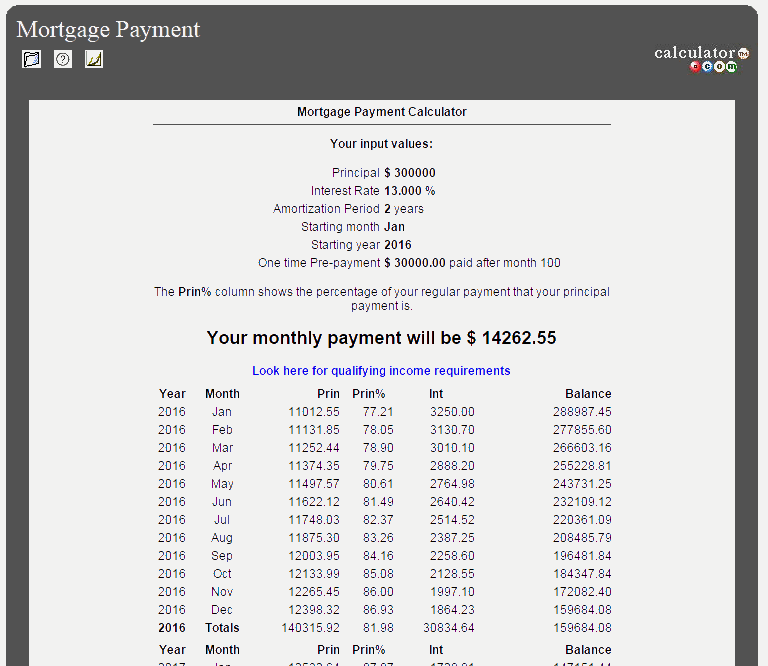 At last, the monthly payment, average monthly interest, total interest, and total payment are displayed. GRUNDERWARE is a website where you can manage your financial resources. An important tool featured on this website is the loan amortization calculator. Enter the loan amount, interest rate, loan length, monthly payment, and any extra monthly payment towards your loan. 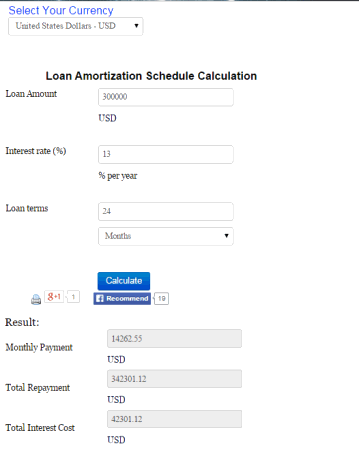 Click on the amortize button, to generate the loan amortization table. The generated loan amortization table displays the balance, interest paid, principal paid, extra paid, and principal balance. WEB TECH ONLINE offers its visitors a range of services, one among it being an amortization calculator. Just enter the loan amount, annual interest rate, length of loan, and the down payment in percentage. On clicking the calculate button, it displays the payment, interest, principal, and remaining balance. ONLINE CALCULATOR has a number of calculators, one of them is amortization calculator. Enter a few details of your loan like, loan term, interest rate, and the loan amount. Amortization schedule is generated after clicking the button, which displays the payment number, payment amount, interest amount, principal reduction, and due balance. 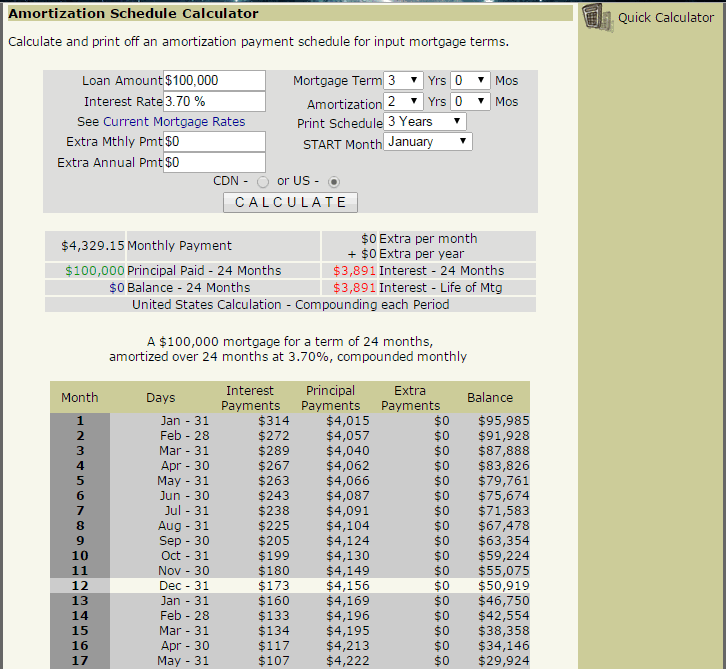 RealData contains a loan amortization schedule calculator. The terms like principal, annual interest rate, loan term in months, first payment month, and first payment year need to be entered. The calculated payment amount is displayed after you click on the button to display amortization chart. The amortization chart displays the interest, principal, balance, and total interest paid. EASYSURF is a plain website which lets you generate amortization table. You just have to enter the loan amount, monthly payment, interest rate, and term of loan. Click on Calculate Amortization Table button to display the amortization table which enlists sum of payments, interest, principal, balance, and total interest. 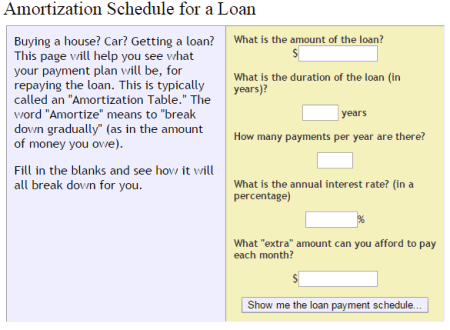 MONEY-ZINE hosts a loan amortization table calculator, which although not being very feature rich, may prove out to be useful in certain cases. Just enter your loan details, like: loan amount, annual interest rate, and loan term. 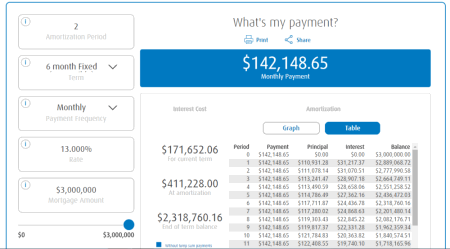 On clicking the calculate button, the calculated results display the monthly payment, total payment, total principal, and remaining principal after each payment.